Janet’s study groups are thriving, with attendance at all-time highs. 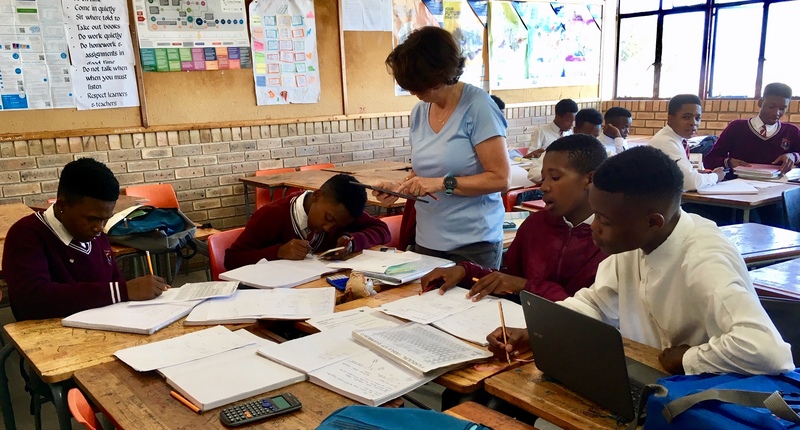 After-school tutoring includes English, math, and science from Monday to Thursday, and university planning sessions on Fridays. 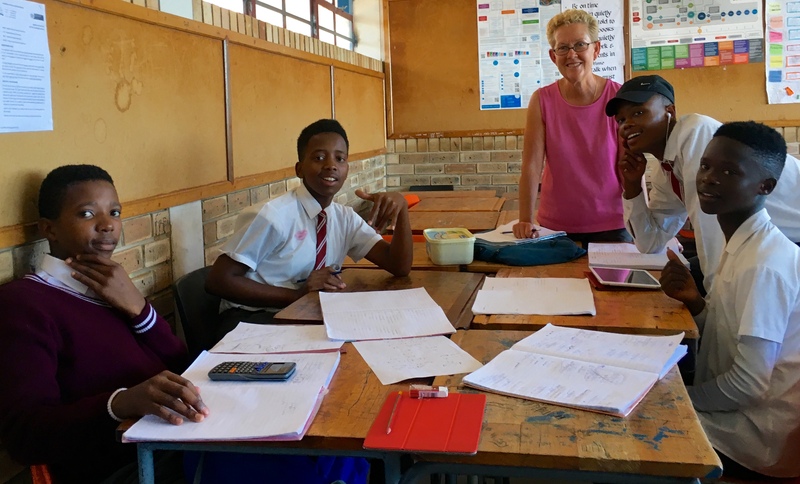 Penny N, our Canadian friend, devotes 2 days a week to Janet’s study groups during her annual stay in South Africa. Penny’s role continues to expand each year and she has become a valuable resource and colleague to Janet. 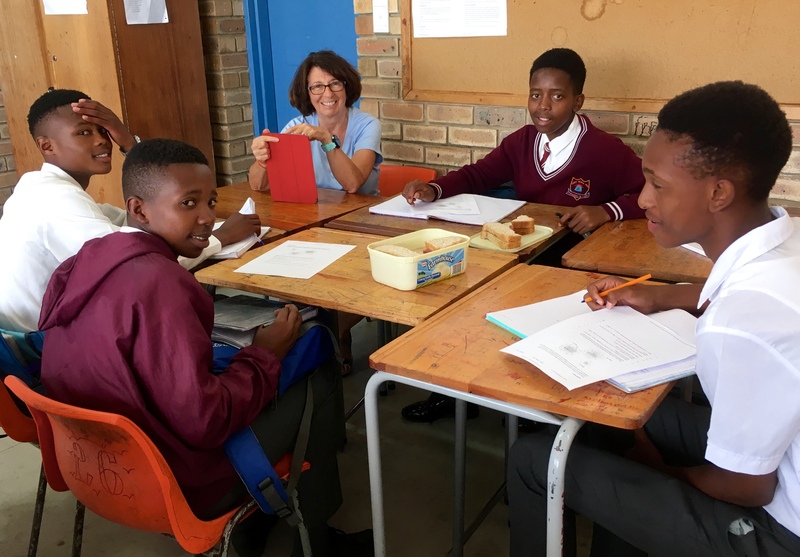 With Janet and Penny working together, the Percy Mdala study group has expanded to include 15 learners. 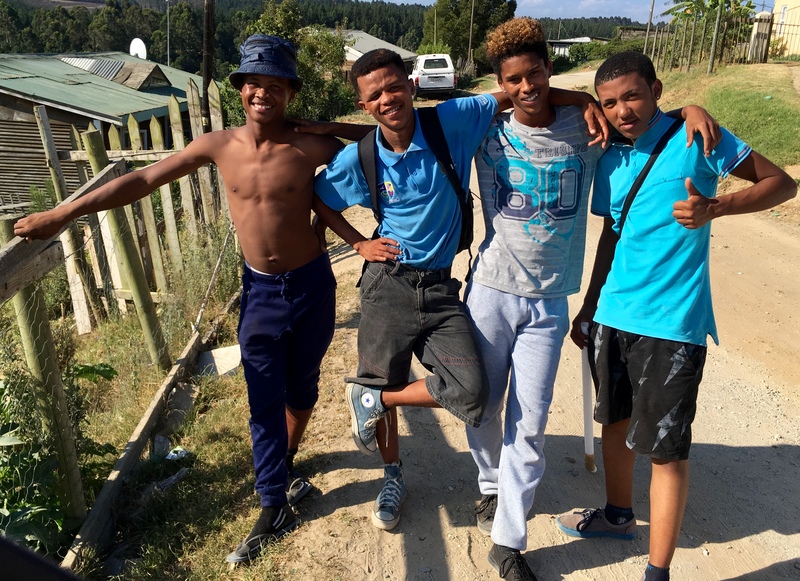 Noticeably absent are Ntokozo, Sibongakonke, and Khanyisa, each of whom completed high school in 2018 and commenced university 1 month ago! Don (far right) with the guys – January 2019. 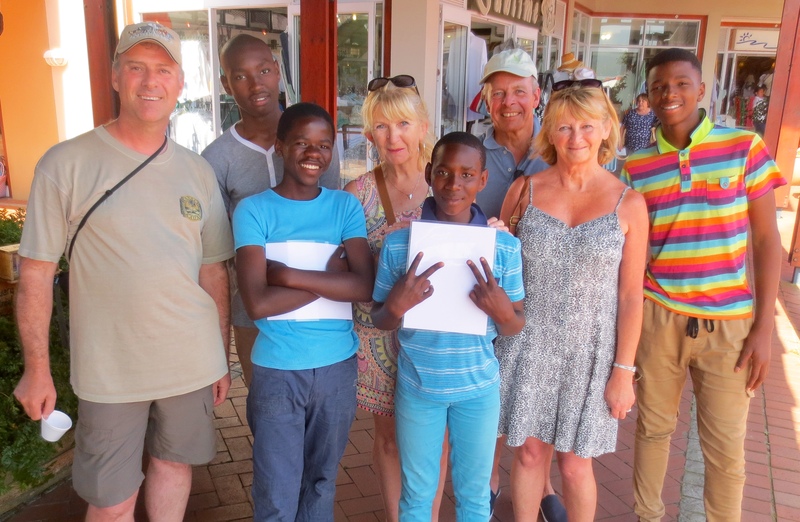 Six weeks ago our friend, Kurt (Khayamandi Foundation board member), visited Knysna from America. 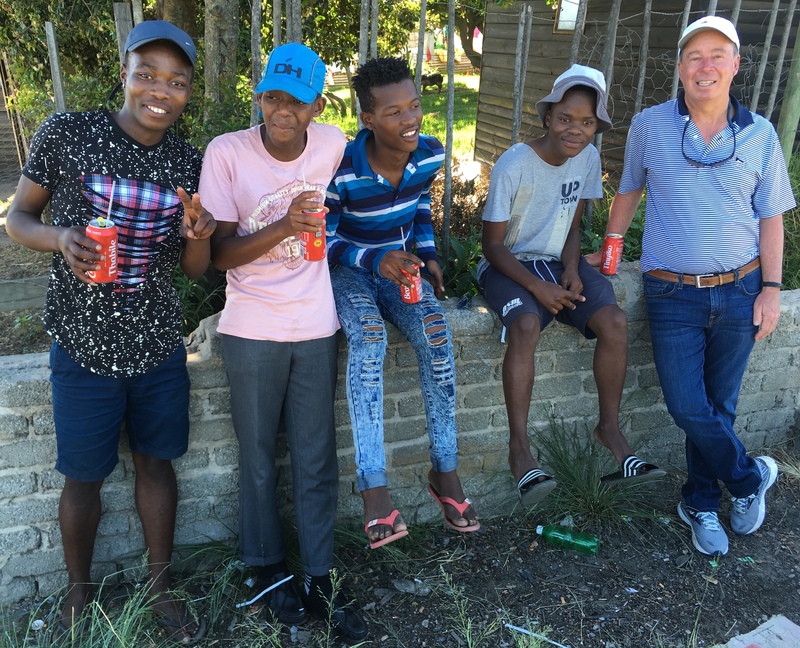 Accompanying Kurt was a friend and business colleague, Don S, whose donations to Khayamandi directly benefit a young man we have known since grade 11 and who completes his undergraduate university degree in 2019. Don (rear-centre) with the guys – January 2019. This was Don’s first trip to the African continent. 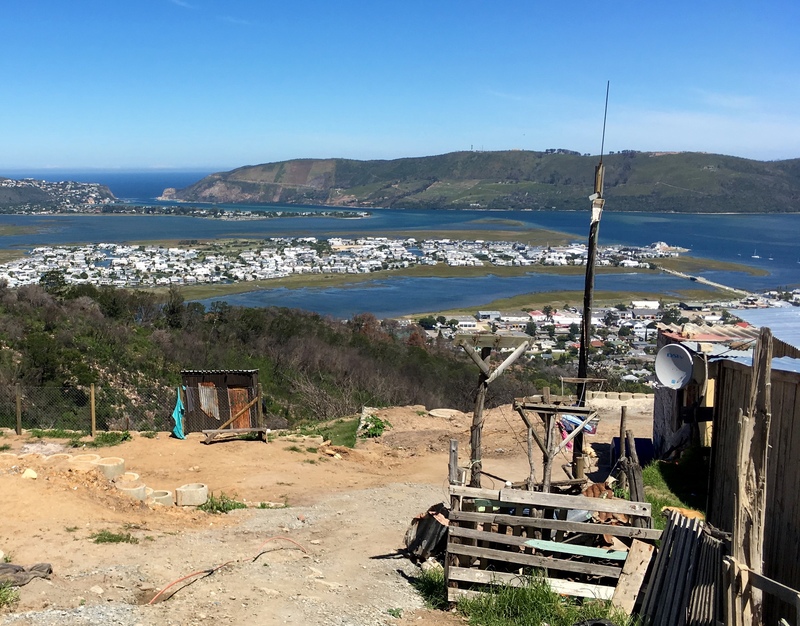 While in Knysna, Jim toured Don through the former townships and introduced him to members of 2 of the 5 groups who signed the December 2018 Peace Agreement. 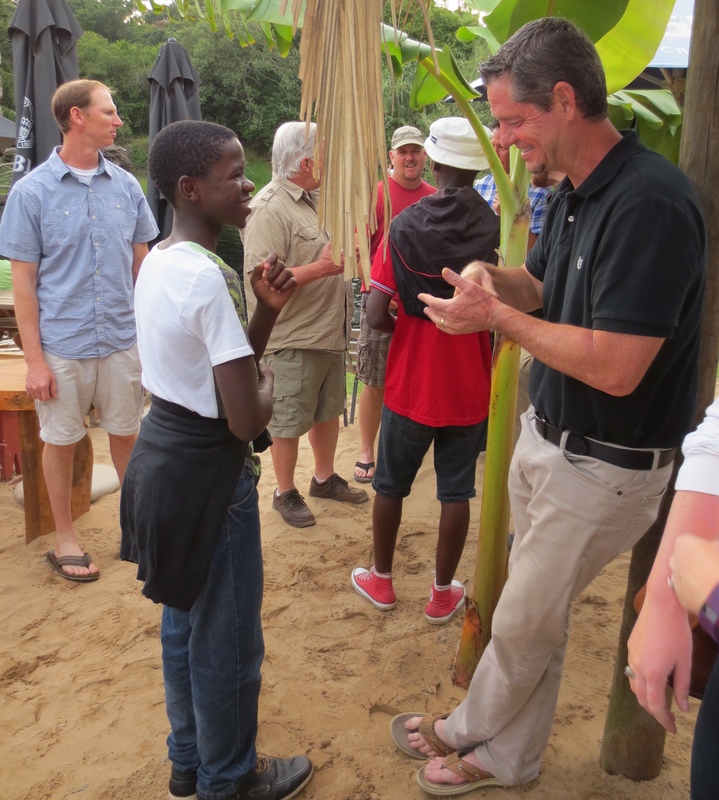 As the boys guided Don through their community, they were able to chat. Jim with the guys (photo by Don) – January 2019. Now that we have peace, a void has been created. 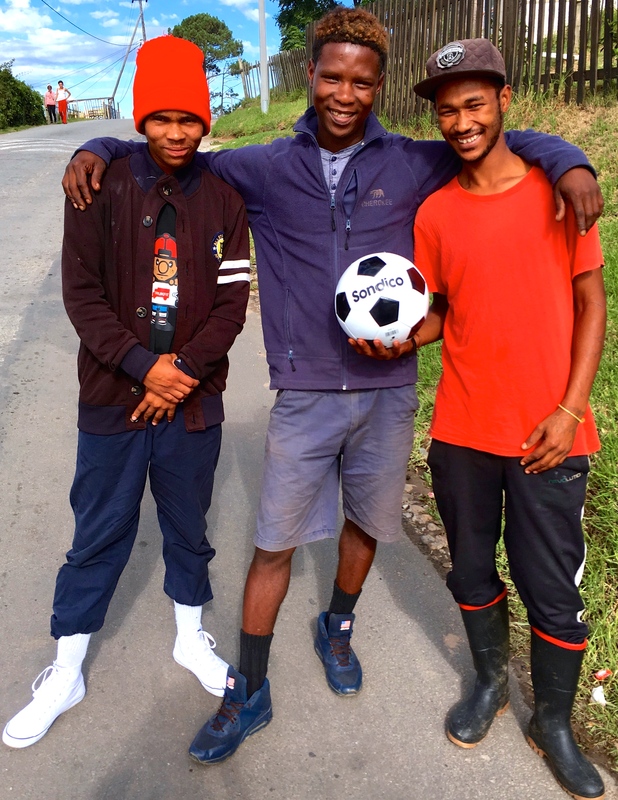 The time previously devoted to fighting needs to be filled and the boys helped convince Don that soccer could be a healthy part of the solution. Discussions were initiated with a soccer coach Jim met in November and a proposal was submitted to Don. Long story short…Don generously provided the necessary funding. 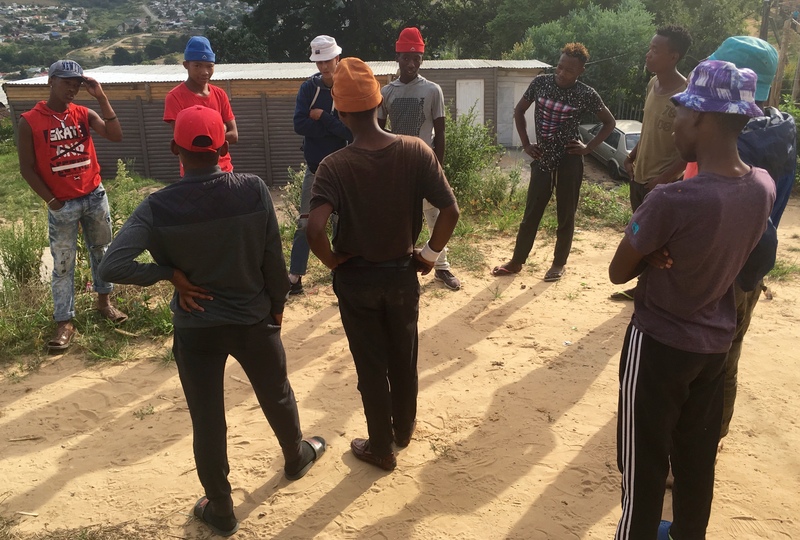 The coach has been retained and 2-3 boys from each of 5 groups have been selected to attend an upcoming soccer clinic designed to launch the program. 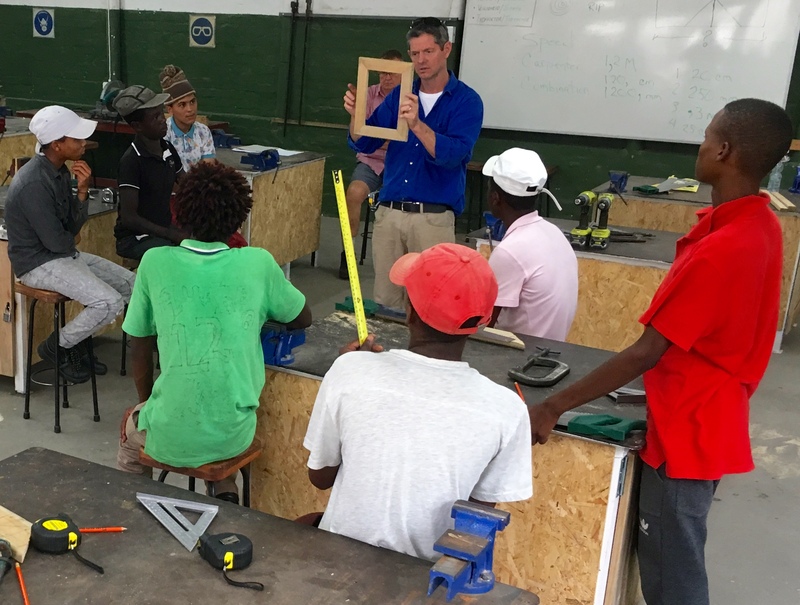 Coop meeting students on Day 1 of the Basic Carpentry Skills program – February 1, 2019. 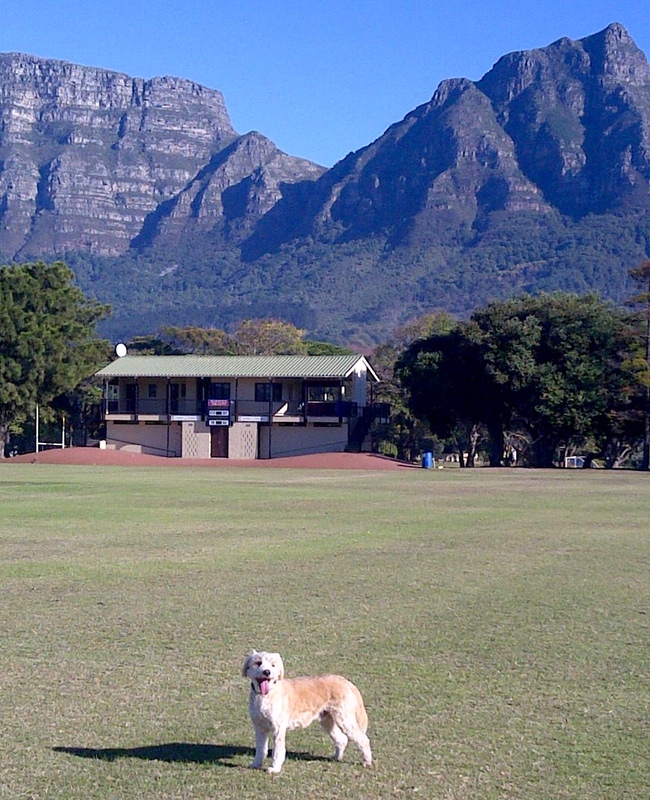 Our friend Coop is from America and spends 3 months each year in South Africa. 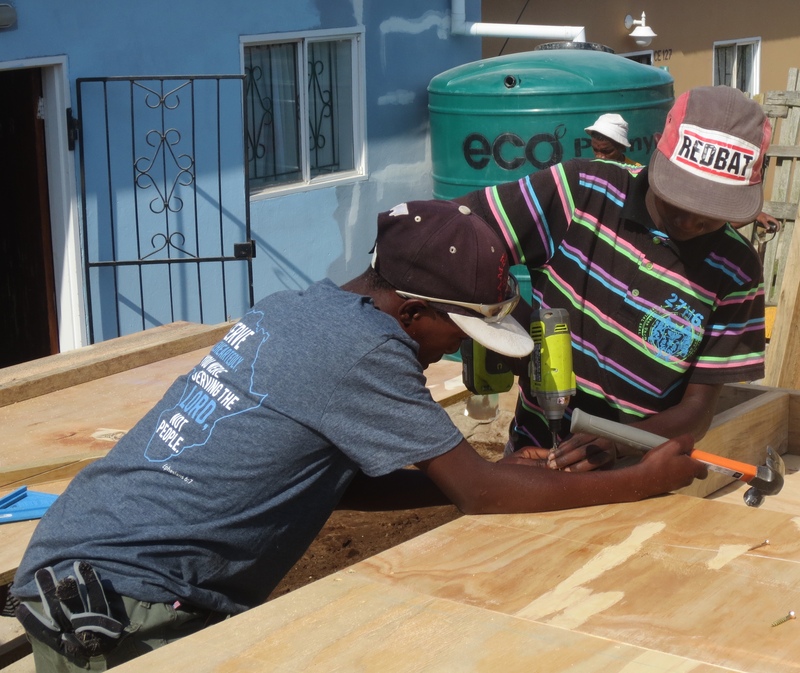 Coop runs a basic carpentry skills program on 9 consecutive Fridays for boys 15-21 years of age, most of whom ceased attending school in grades 7 or 8. This year, 8 of the 15 boys are members of the groups who signed the December Peace Agreement. Coop is being assisted again this year by our Canadian friend, Don C.
Coop instructing the 2018 class. Jim recruits the students during November-December, and Coop and Don develop the program and provide the training. Coop and Don deliver an outstanding program, and the young guys absolutely love it. Breakfast and lunch are included, which means ample quantities of fresh food personally prepared by Coop and Don! 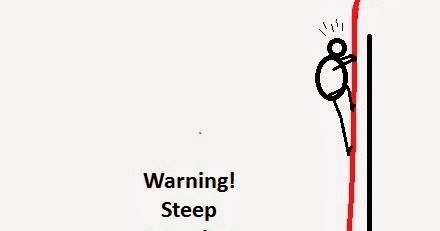 Three steps forward…Much has been accomplished, but not all is positive. Sadly, the 17 year-old boy in the above photo was stabbed and killed on February 3, 2019. His death was not gang-related, hence the Peace Agreement was not compromised. Junior, as he was known to his many friends, is fondly remembered and will not be forgotten. Peace prevails, but there was a hiccup. 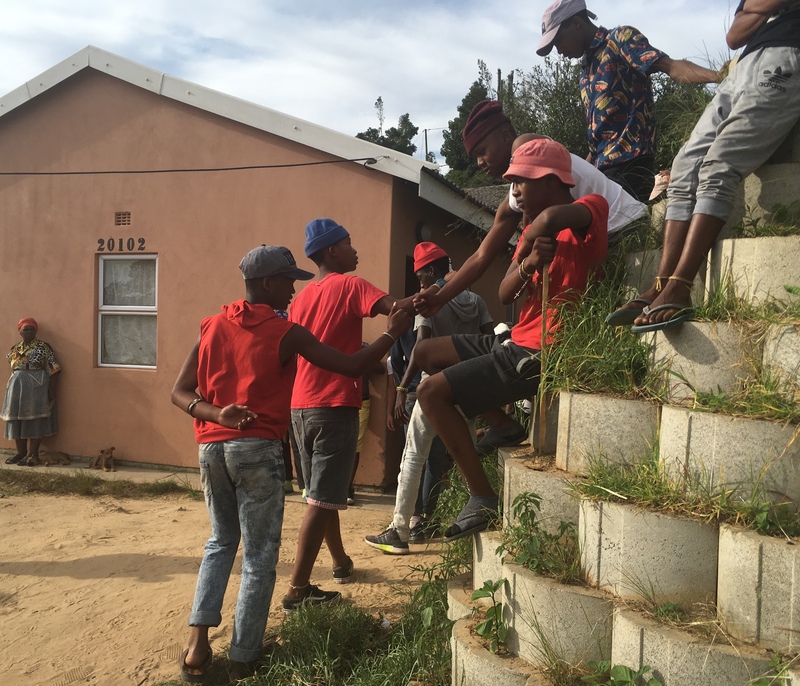 Earlier this week, there was an altercation between a lone boy from one group and 8 boys from another. The single boy apparently did not want to give way to 8 boys walking abreast towards him. The first time, the 8 boys parted and let him pass. Later the same day, the single boy held his ground and pushed 1 of the 8 to the side. The 8 guys beat him. The next day, the single boy gathered some of his friends and initiated a revenge fight against the 8. 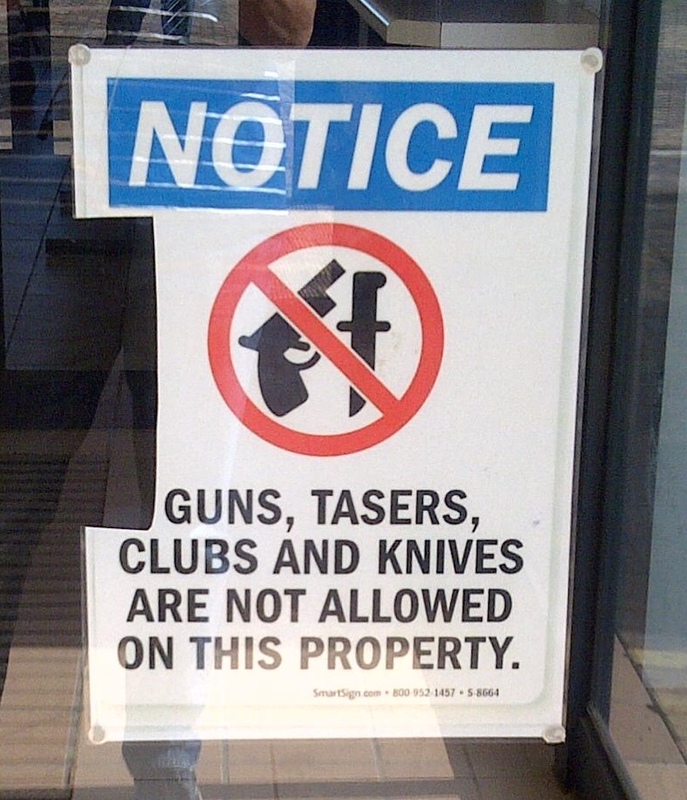 One positive aspect is that neither fight involved knives. The day after the revenge fight both groups of boys were ready to talk and wanted to restore peace. Jim drove the 4 boys responsible for the revenge fight to the hangout of the group of 8, and there we met with approximately 20 of their members. The atmosphere was initially tense, but slowly progress was made. These photos depict the process as it unfolded, which eventually resulted in handshakes, smiles, and laughter. Peace was restored, which means safer streets, safer schools, and healthier communities. Archbishop Desmond Tutu was born in 1931, son of a primary school Principal, opponent of apartheid, recipient of the Nobel Peace Prize (1984), author, and served as chairman of South Africa’s Truth & Reconciliation Commission. The Archbishop wrote the introduction to a book entitled Reclaiming Youth At Risk: Our Hope For The Future. We’d like to share the introduction with you. Hands & Heart carpentry/welding program (March 31, 2017). Thank you, Kurt (standing with hands on youth’s shoulders), for volunteering many hours the past 3 months. 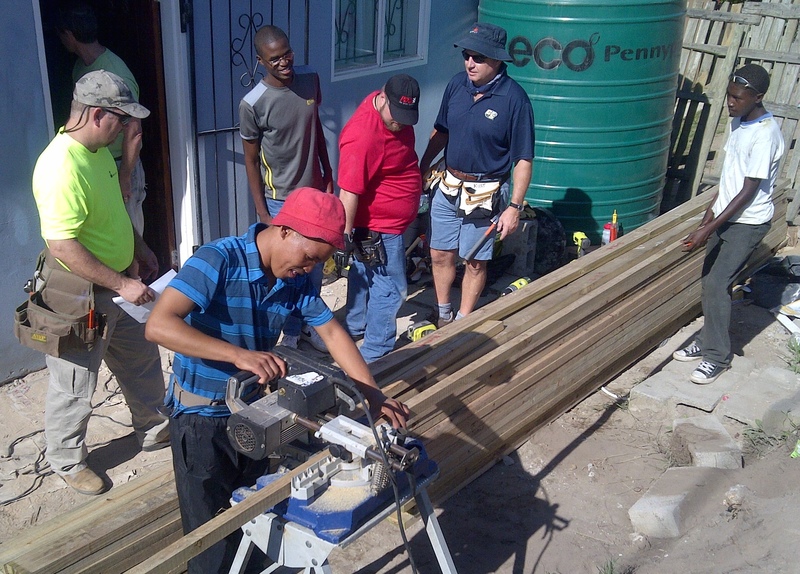 Chaylon attends the Friday carpentry training for boys who struggle with reading. After weeks of perfect attendance, Chaylon missed 2 consecutive Fridays because his only pair of shoes were no longer wearable. 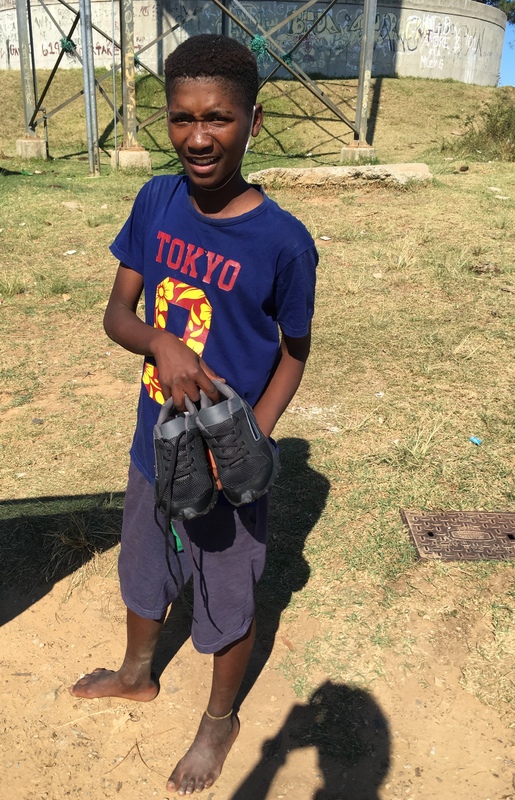 We purchased shoes and socks for Chaylon last Thursday and he returned to the carpentry programme the following day. 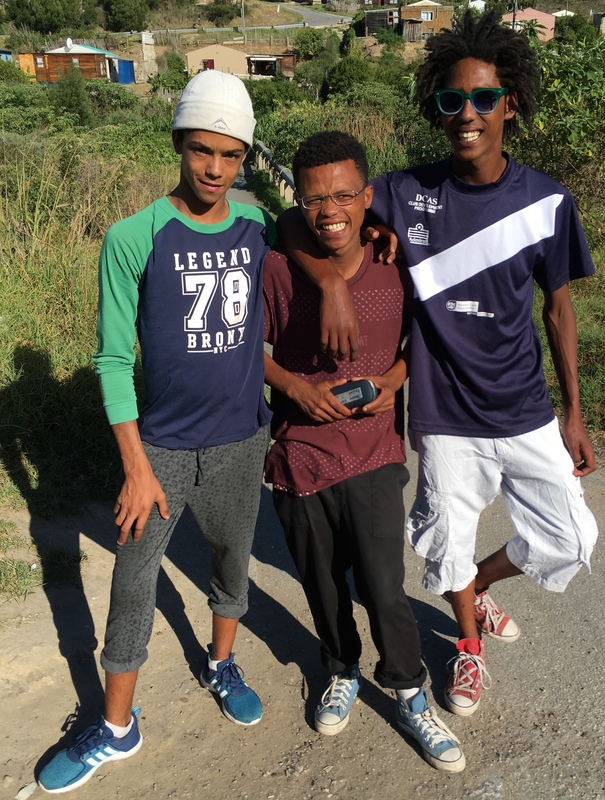 Leighton (centre) turned 14 in January and commenced grade 8 in January 2017. One month ago, Leighton’s high school deregistered him based on 11 days of arriving late or being absent. Leighton’s mother only learned about his lateness and absenteeism on the day he was deregistered. 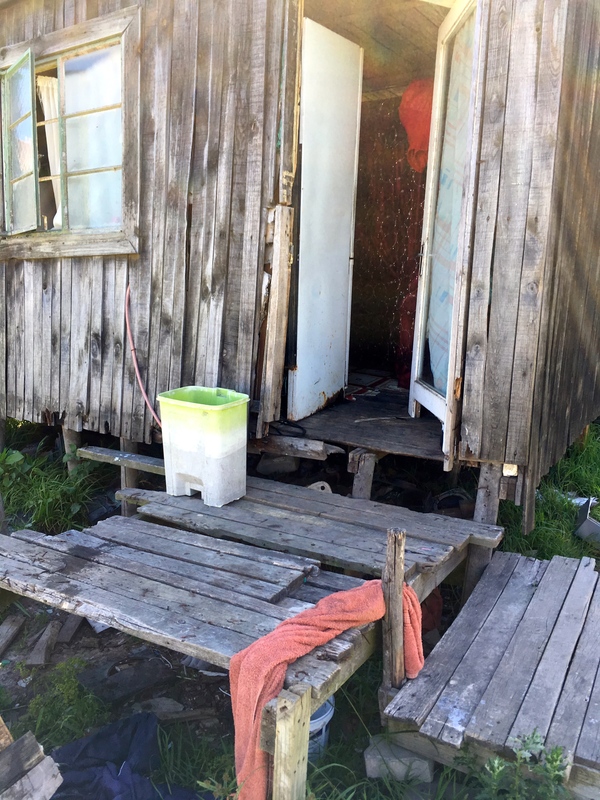 Department of Education policy dictates that “Schools have a responsibility…to investigate and to assist parents and learners to remedy the situation”. On behalf of Leighton’s mother, Jim contacted the Department of Education and officials intervened. 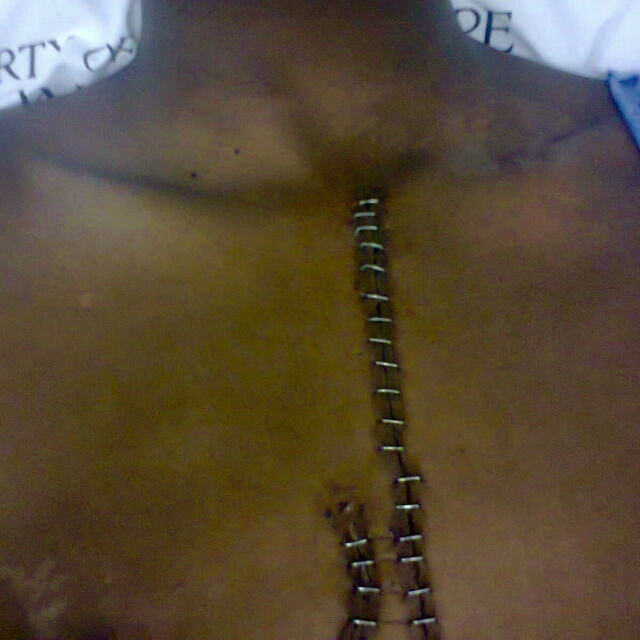 Three weeks later, Leighton was permitted to return to school. 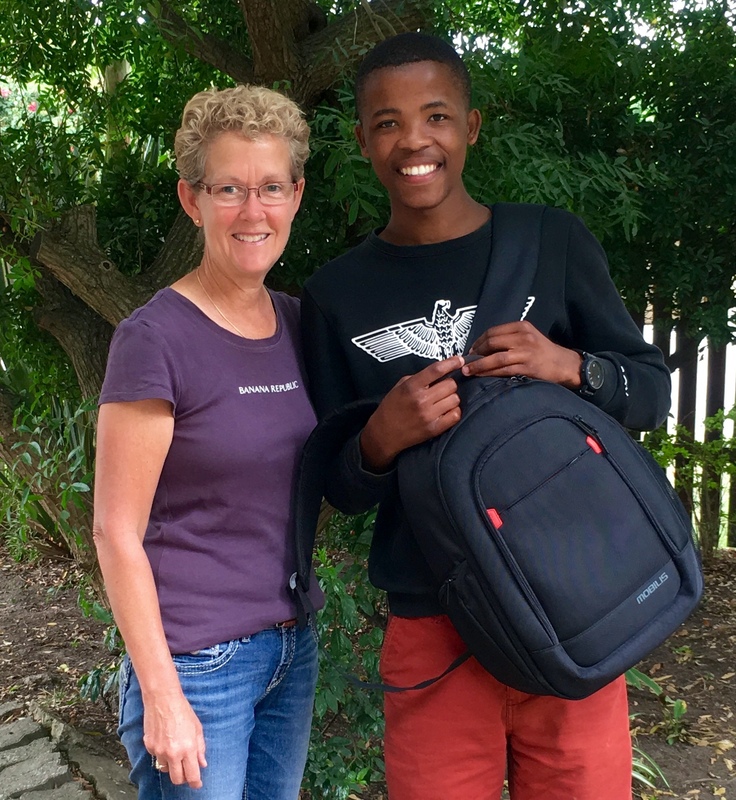 Listen to Siyathemba’s thank-you for the reconditioned laptop he received in January 2017, prior to commencing his first year at the University of Western Cape. 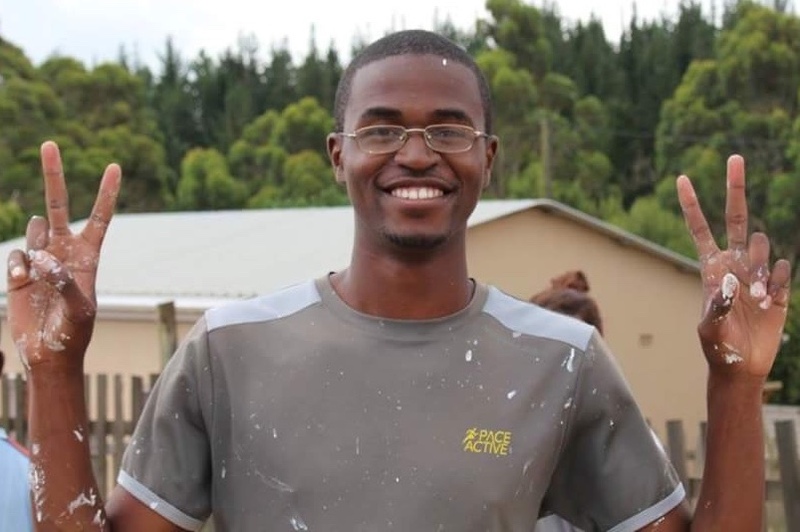 We met Siyathemba when he was in grade 8 and he regularly attended our Bulele mentorship meetings the past 4 years. 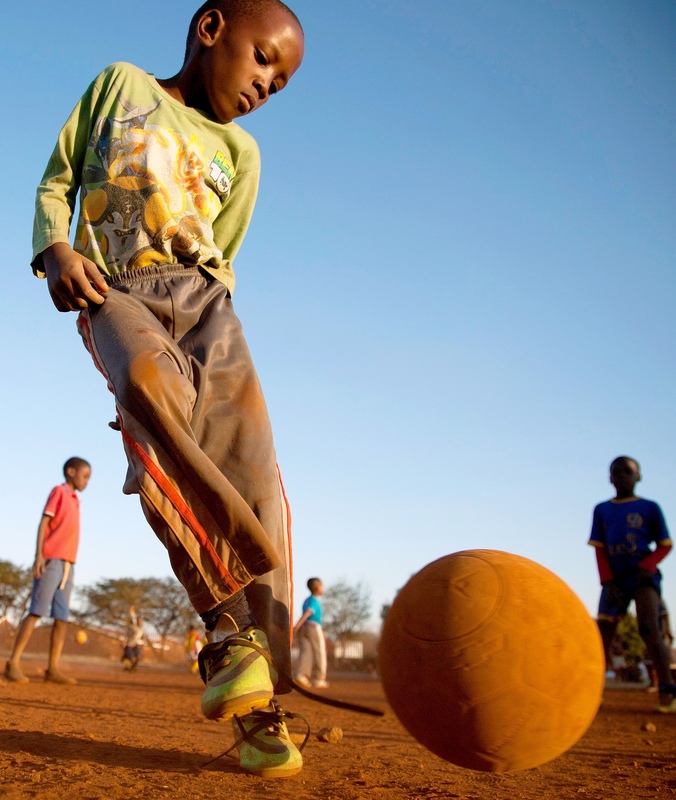 Thank you for following our initiatives in South Africa, and caring about the youth whose stories we are able to share. In the interest of confidentiality and youth safety, there are some stories or details we are unable to share. 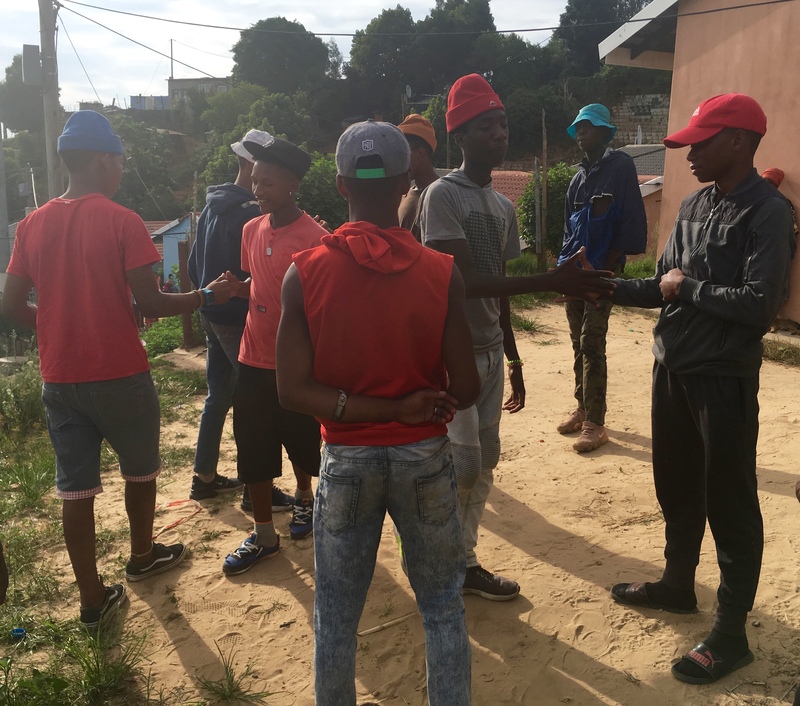 The physical and emotional abuse faced by too many boys at home, or on the street, is real. 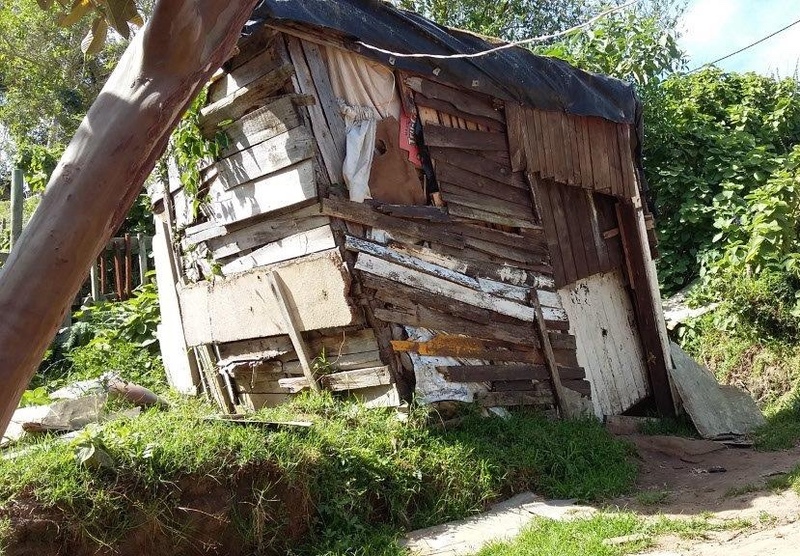 While none of the youth are perfect, and they sometimes behave like typical teenage boys, their determination in the face of hunger, inadequate housing, or lack of shoes/basic clothing, is impressive. 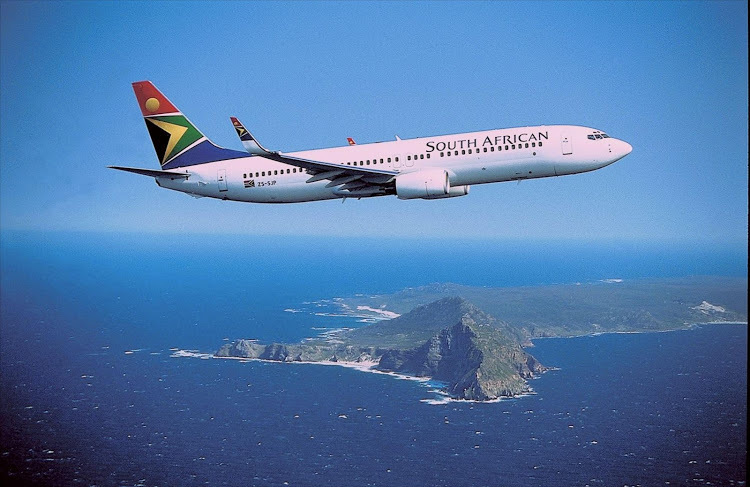 Only 5 weeks remaining until we depart for South Africa, and we can’t wait! 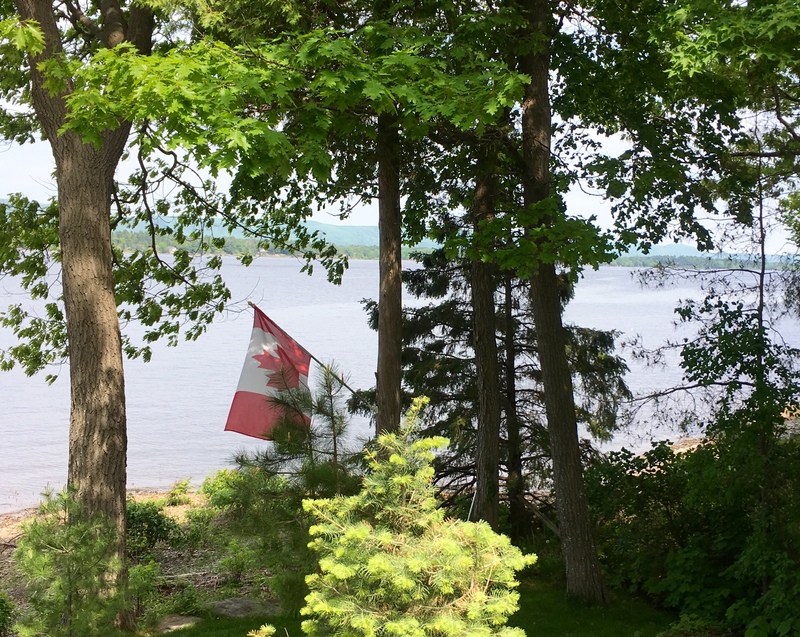 During our time in Canada, Janet continued to tutor some of the boys in math, and Jim mentored from afar (using Whatsapp Chat). 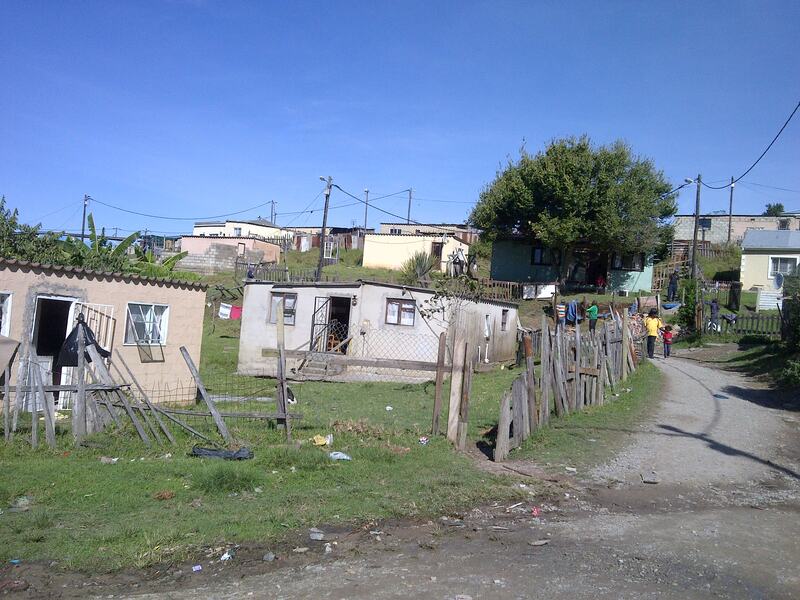 With so many social-ills in South Africa, one could easily become overwhelmed. Remaining focused on our mandate helps us maintain perspective and remain passionate. 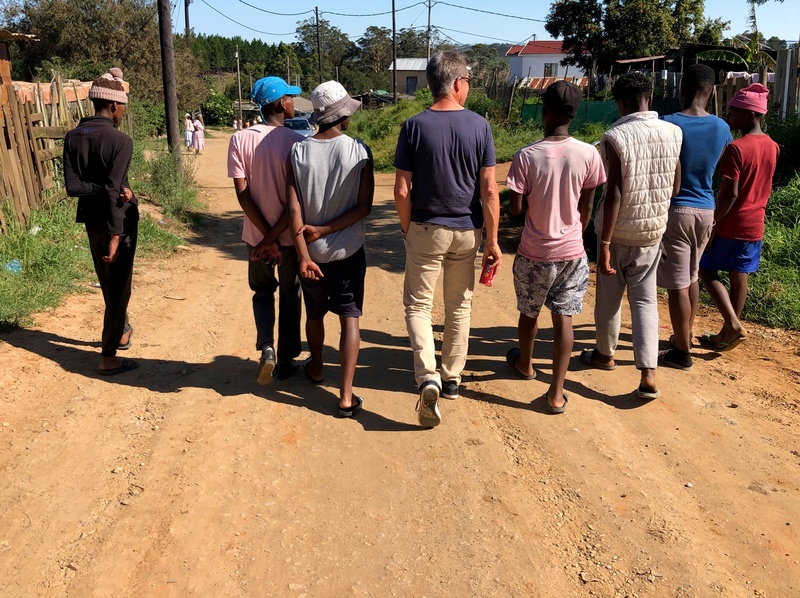 When we originally visited South Africa and Zimbabwe, many youth identified the shortage of male role models in their lives, and how this has negatively impacted them and their impoverished communities. 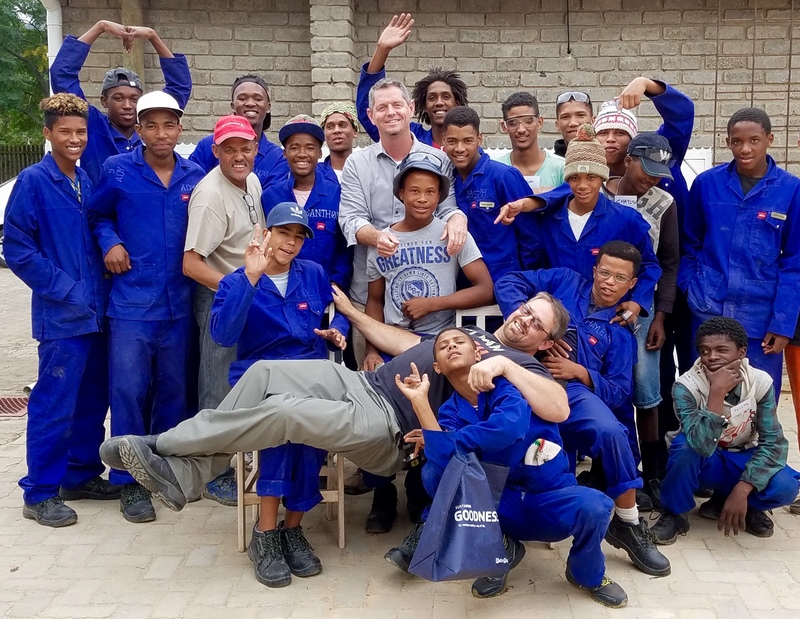 Mandate: Developing Male Role Models, by helping youth navigate life. 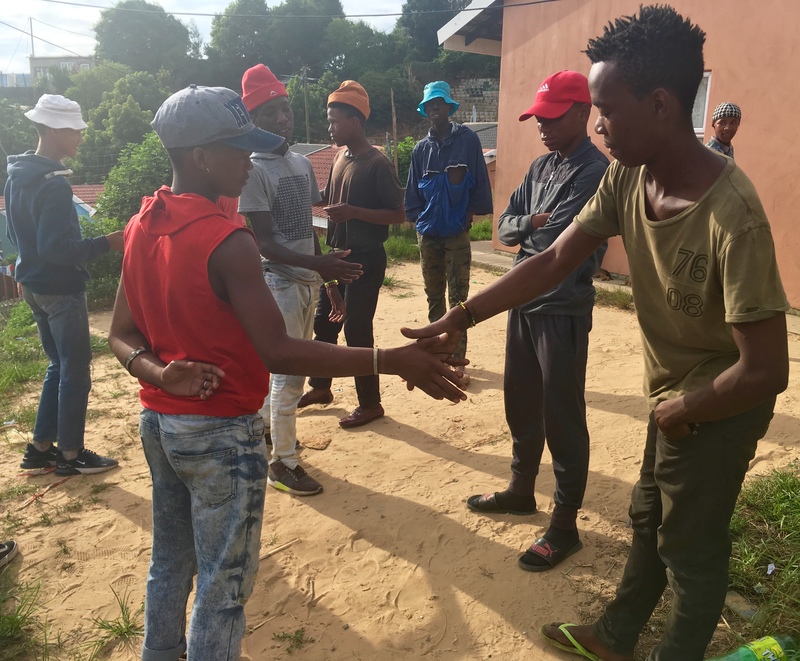 We mentor disadvantaged male youth by imparting life-skills and educational support, to better enable youth to navigate life. Our ultimate goal is a more able, better-educated, self-supporting young man who serves as a positive role model. 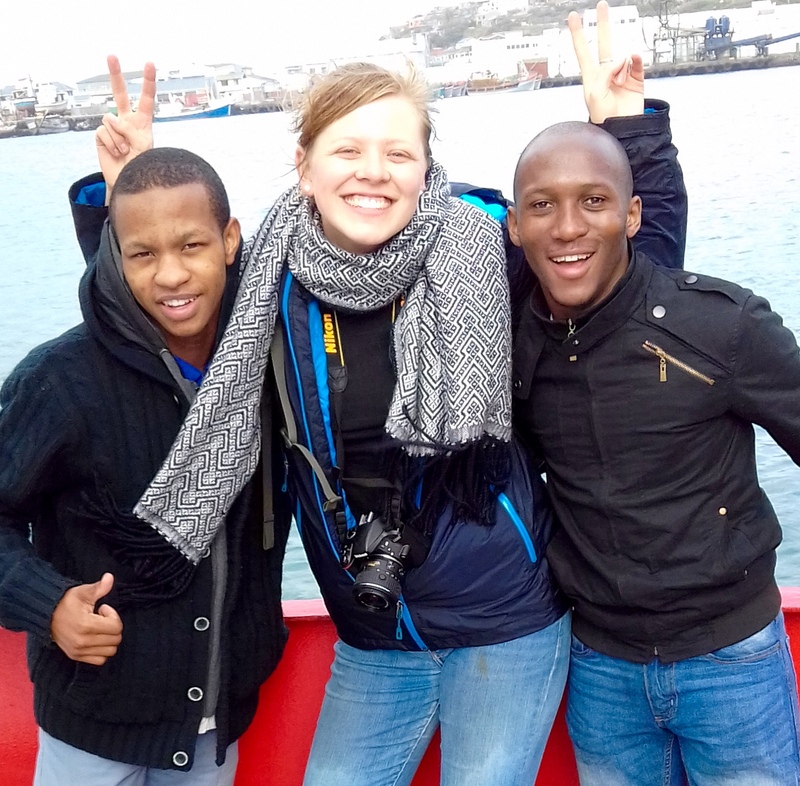 L to R: Paul’s classmate, visiting student from Northwestern University – Boston (USA), and Paul. The following are excerpts from a newspaper article about Paul, whom we met 3 years ago while he was studying at TSiBA Eden College. “You have to look back in order to know where you going” These are the words by which Paul Itumeleng Mphambani lives. 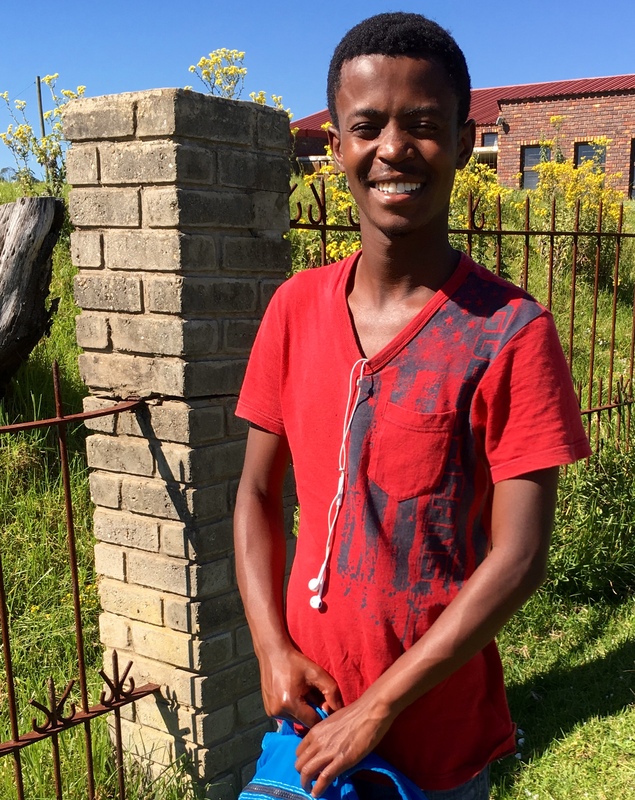 Paul, 27, grew up in Soweto with his mother and five siblings. After his mother passed away, Paul knew he would have to be the future breadwinner and desperately needed to get an education. 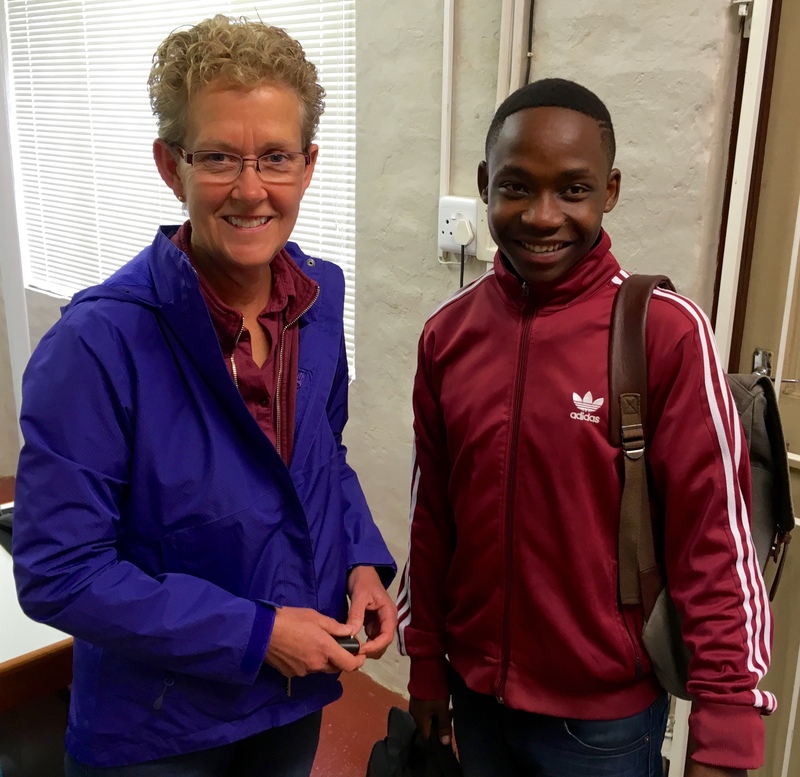 Daniel lives in Zimbabwe and is so excited to be starting his first year at university this week! Upon graduating high school (O-levels), Daniel completed 2 years of A-Levels (pre-requisite for university) in December 2015. His final term mark was 14 out of a possible 15. Very impressive. 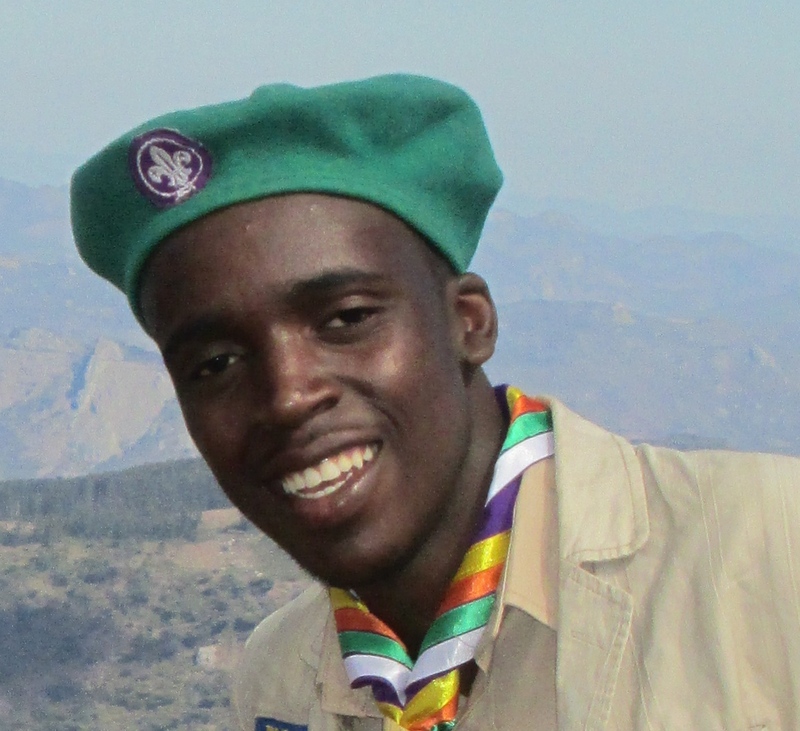 Daniel is one of the most on-purpose young men we know and remains an active leader in the Scouting movement in Zimbabwe. 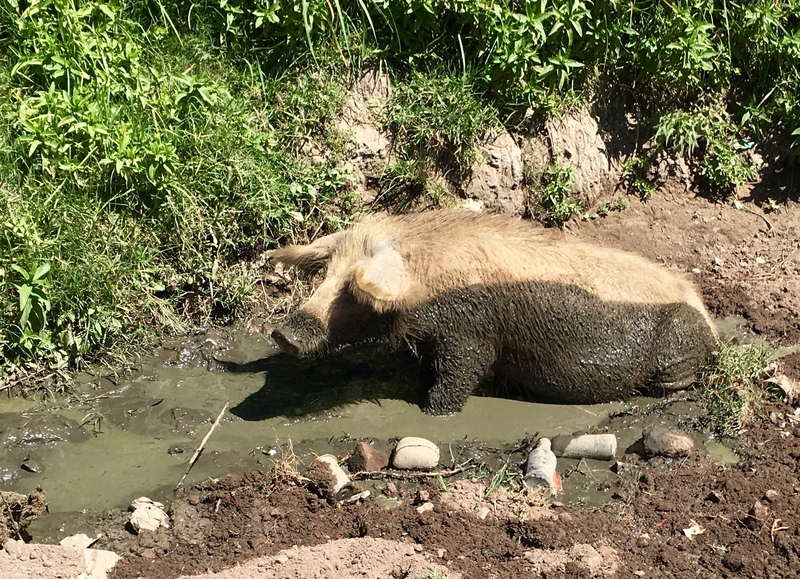 It won’t be long before Janet will resume her weekday routine of preparing sandwiches for the boys she and Jim tutor/mentor! “I’ll tell you straight. They need all the things you and I give to our own children. What poor kids need is a lot. 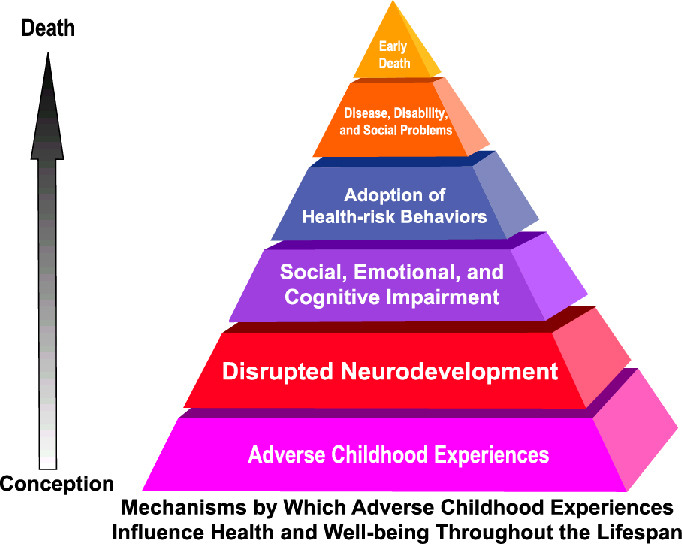 But you can sum it up by saying that what they need is a decent childhood.” G.C. Youth Update: Most of the boys and young men continue to do well, but a few are struggling. 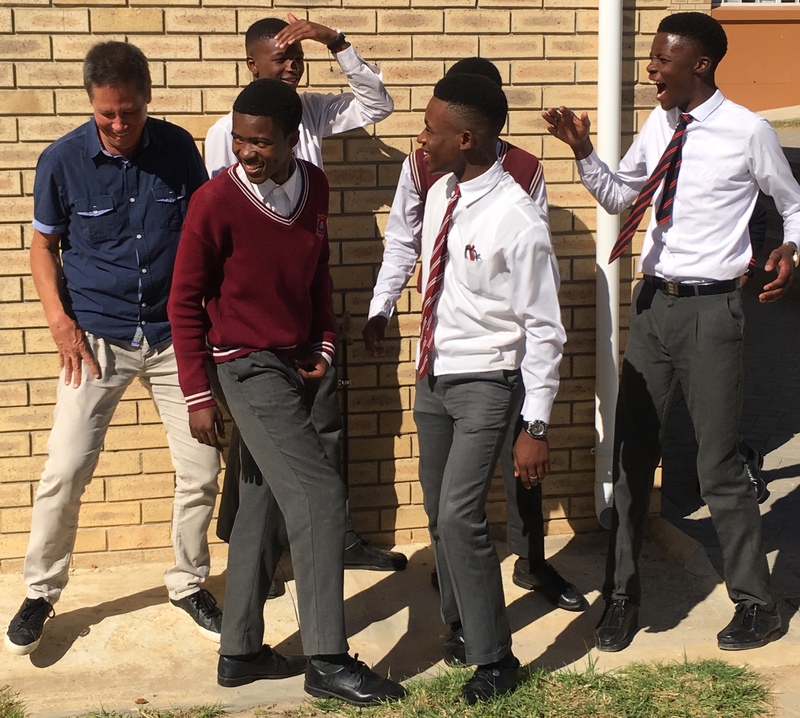 Ben, Wanga, Aphiwe, Kudzai, Paul, Onke, Siyathemba, Thomas, Mandla, Luyolo, Robin, Vogen, and others (no particular order) are making us particularly proud. 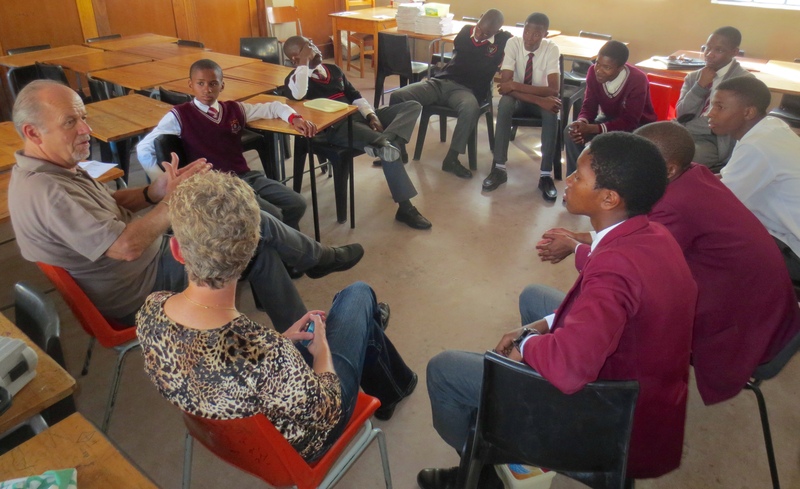 Your donations allow us to support the education of each of these deserving young men. All are studying at the college or university level, or graduating high-school this December and are university-bound. Thank you for your financial contributions which make these and other success-stories possible. Eugene is 17 and dropped out of school because he never learned to read. His situation is too common, and is more complex than a few sentences can explain. 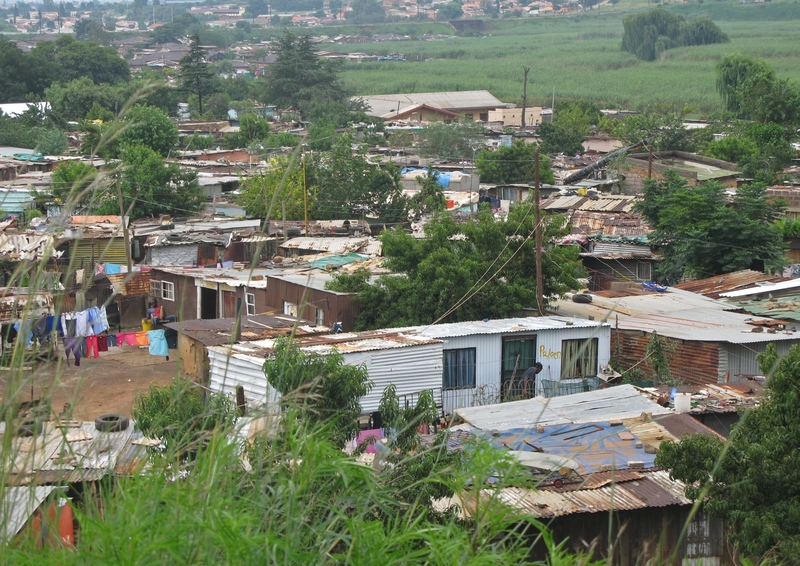 When Jim departed South Africa in May, Eugene was essentially homeless. Saying good bye to him was very difficult. Regrettably, we know too many ‘Eugenes’. 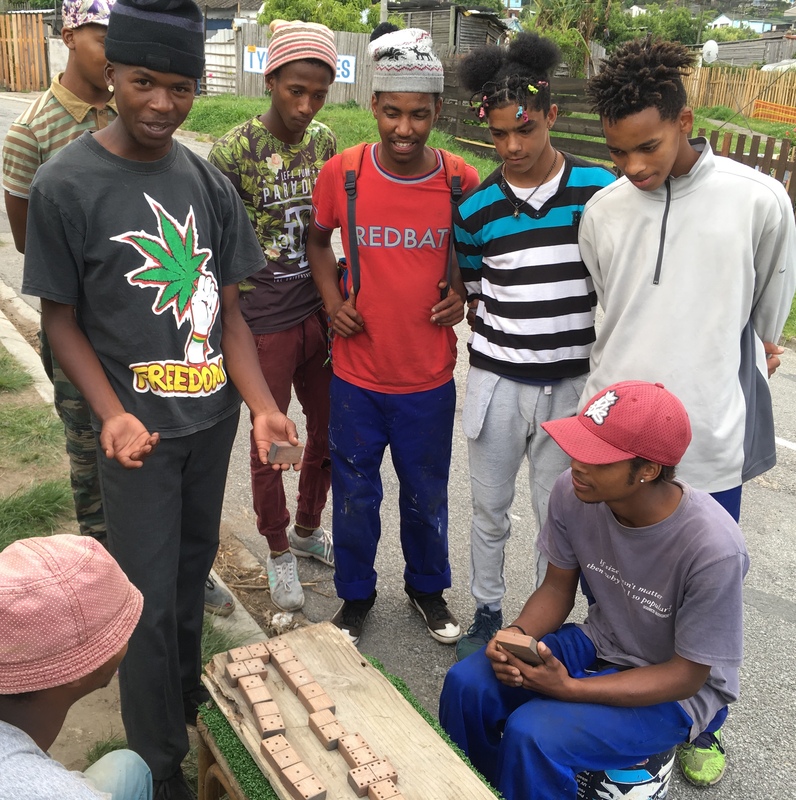 Teenage boys who are functionally illiterate need a skill which makes them employable, and they need the life skills necessary to retain employment. None are ready for employment, even if a job opportunity existed. Their life skills are as lacking as their literacy/numeracy skills. Next week we commence the search for retired men whose hobbies include carpentry or woodworking. Using print and social media, we are seeking men each willing to mentor 1 youth for a 3 hour period, 1-2 times per week. Suitable mentors must also be interested in imparting life skills. 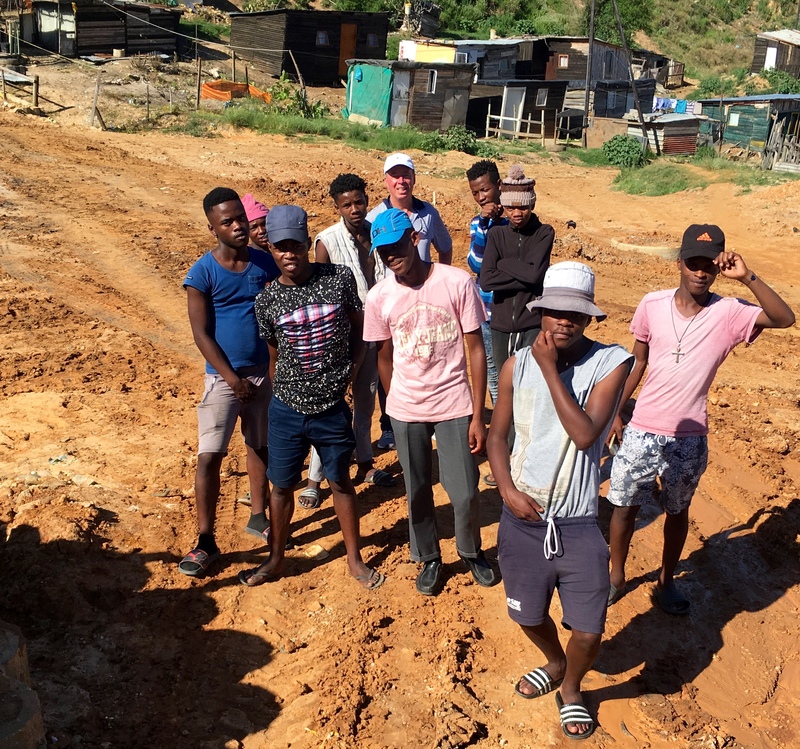 While the mentorship relationship will be structured around 3 hour sessions designed to teach basic carpentry and use of hand-tools, much of the mentor’s role will be that of social worker. 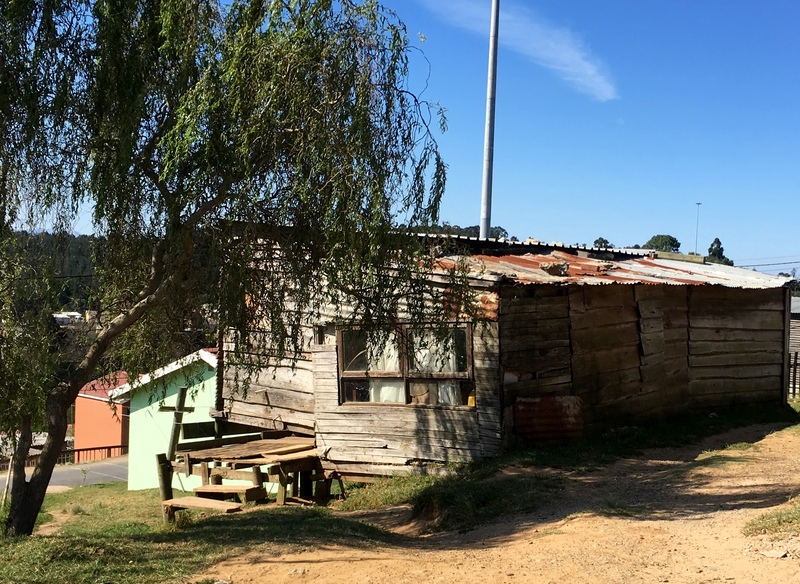 We have been engaged in discussions with a well-established Knysna NGO about partnering with us on this initiative and, in the least, providing facilities where the carpentry training would be delivered. 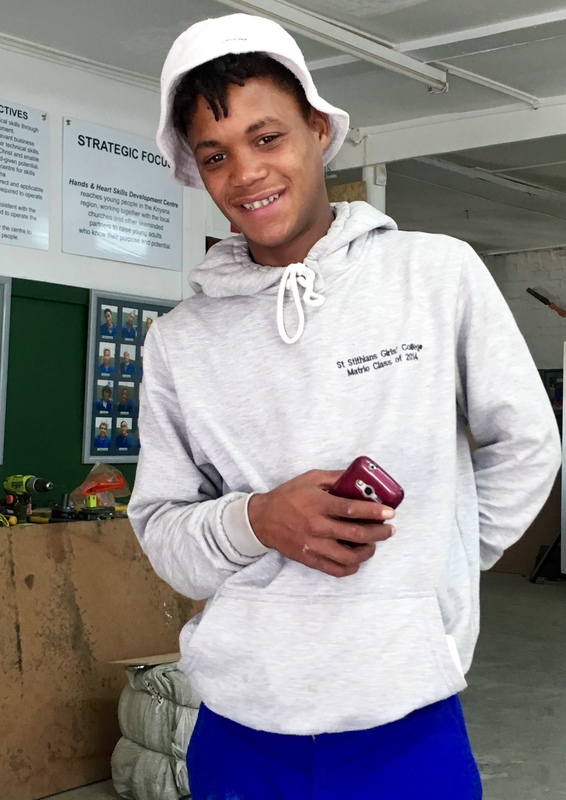 While we anticipate it may be a challenge to identify suitable mentors, we need a solution to restore hope for youth like Eugene. We will keep you updated on our progress. 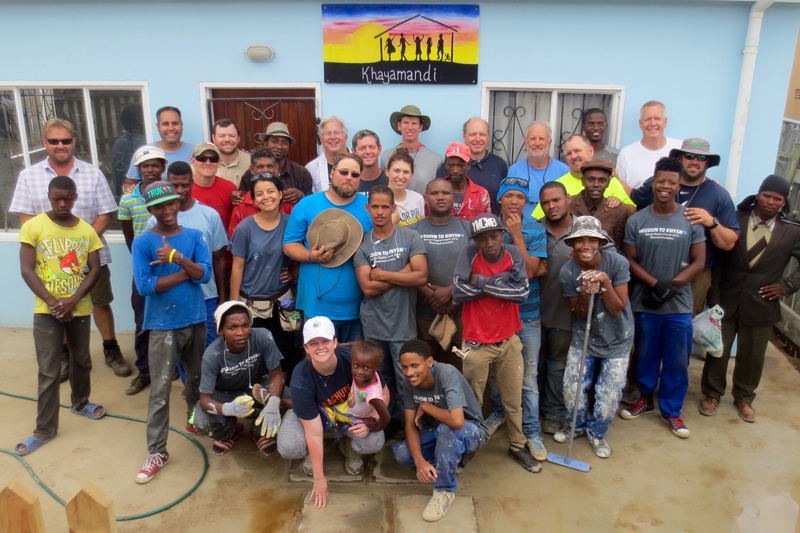 Africa is not for sissies, and there certainly were no sissies when the Khayamandi Foundation recently returned to Knysna. 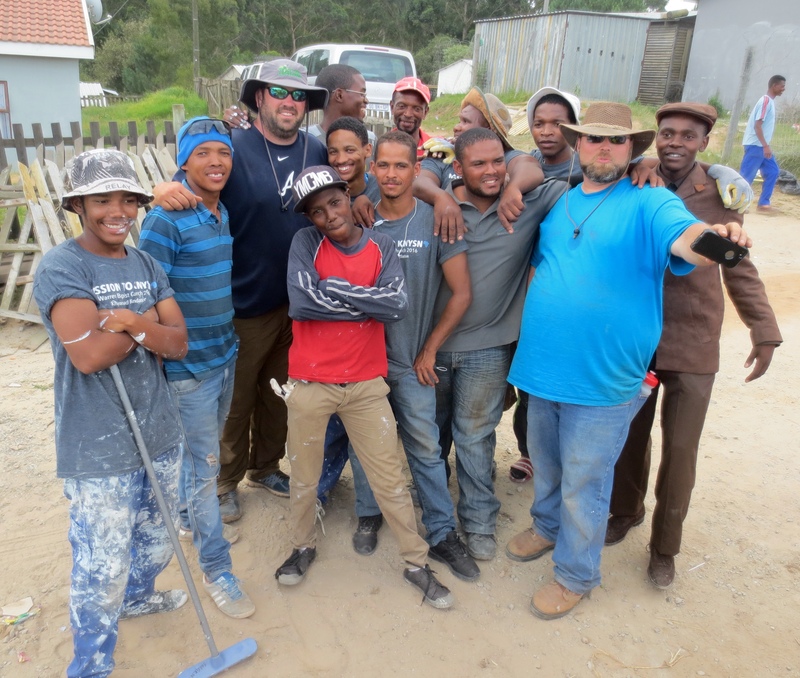 The group of 14 from America worked alongside local tradespeople and youth, including 12 of the boys and young men we mentor, to complete a 4 bedroom addition to one of Ella’s & Penny’s safe houses for young children. It is always a jam-packed week when the “Americans” are in town (lol), with plenty of positive and lasting impact. 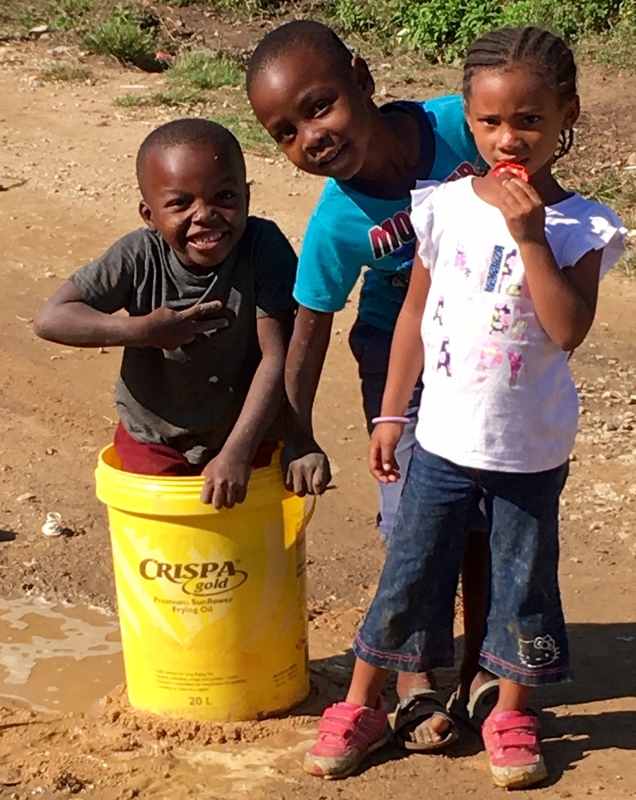 Everyone worked extremely hard under the hot African sun. 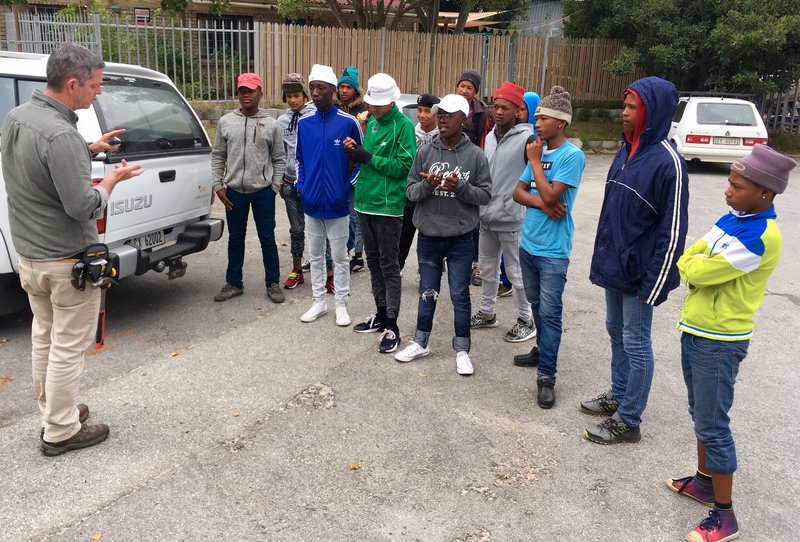 This was the first real job for most of our 12 boys, but they quickly demonstrated their willingness to follow instructions and remain focused. 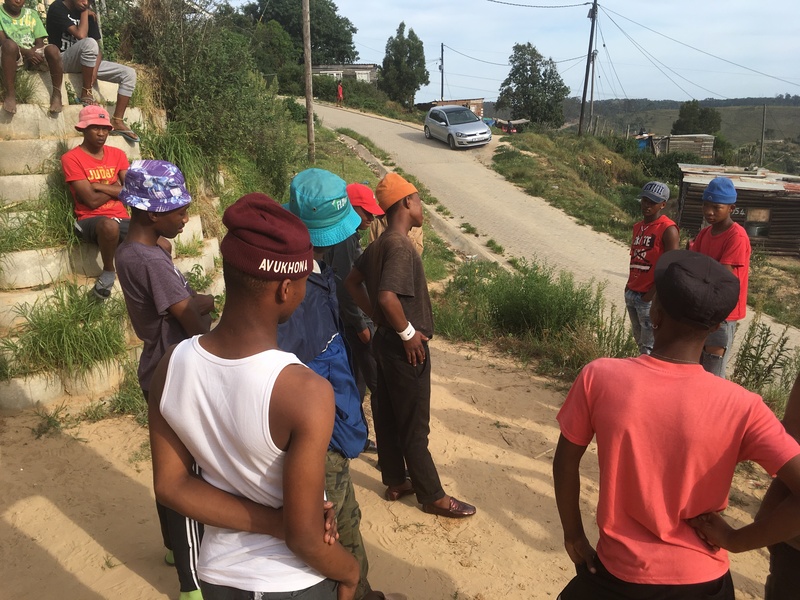 The 12 guys included Ben, who just completed the 2nd year of a Computer Science degree and whose education is sponsored by Khayamandi, 3 former gang-involved boys who took the day off school to help, young guys who were waiting to start college the following week, and others who dropped out of high school 2-3 years ago. It was a life-altering experience for all the boys. 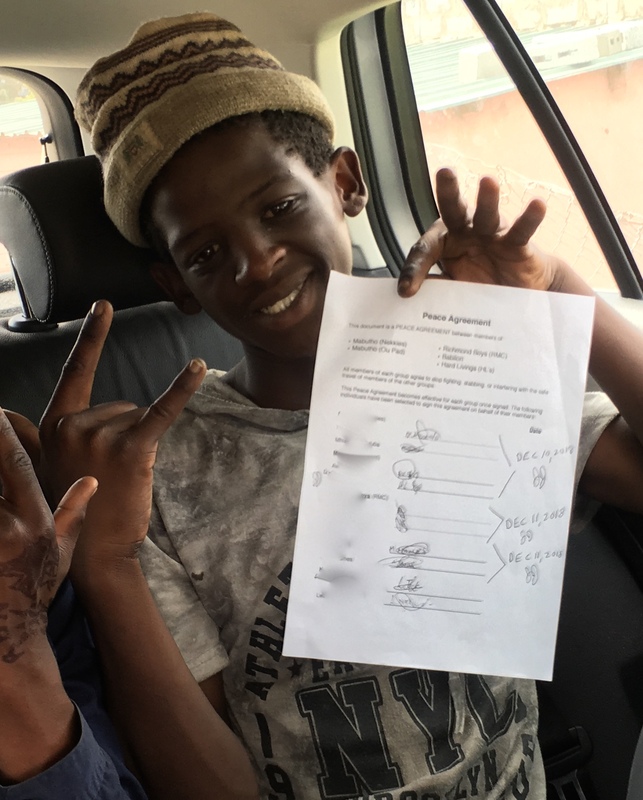 Rhino is 16, stopped going to school in grade 7, and cannot read. 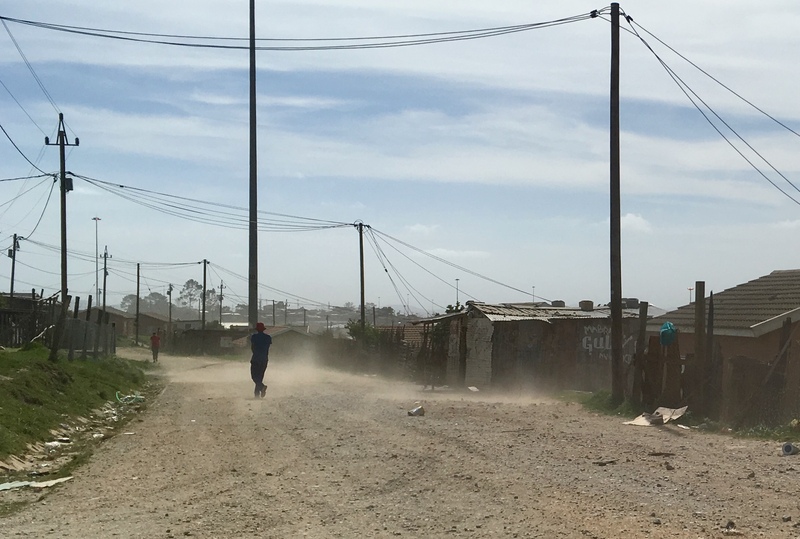 We met him in 2014 when he walked onto the Khayamandi site and worked the full week with no expectation of financial compensation. 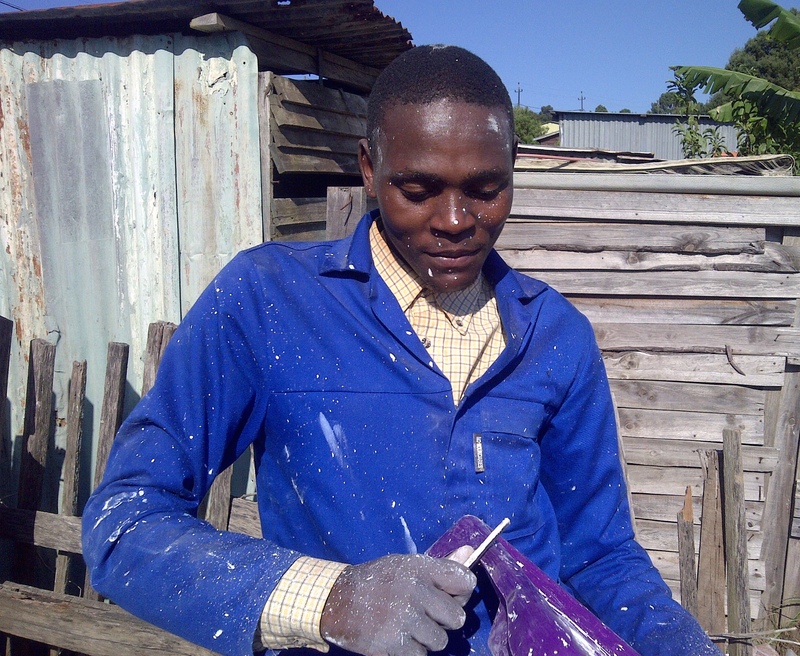 He returned for the 2016 Khayamandi week which led to a permanent job with the project’s general contractor and Rhino is now learning the skills of carpentry. 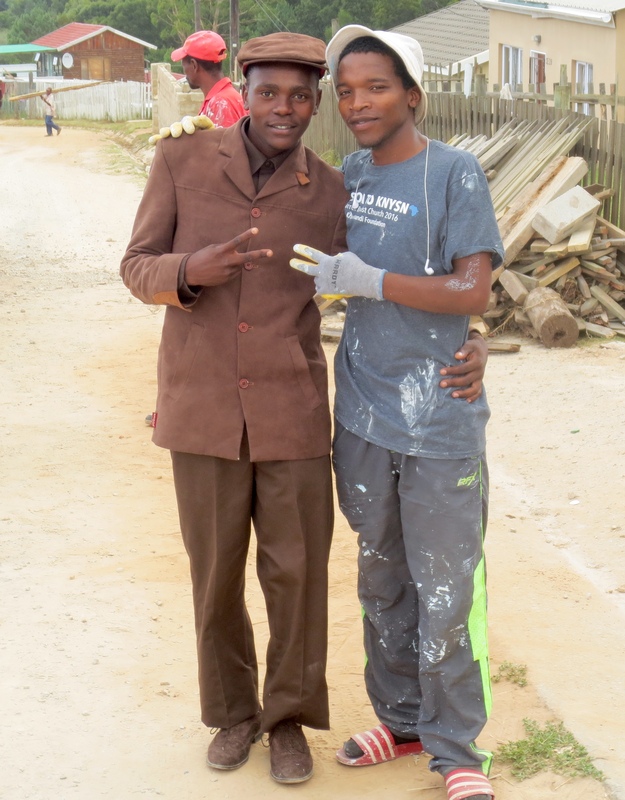 Olwethu is in grade 10 and decided he also wants to become a carpenter. 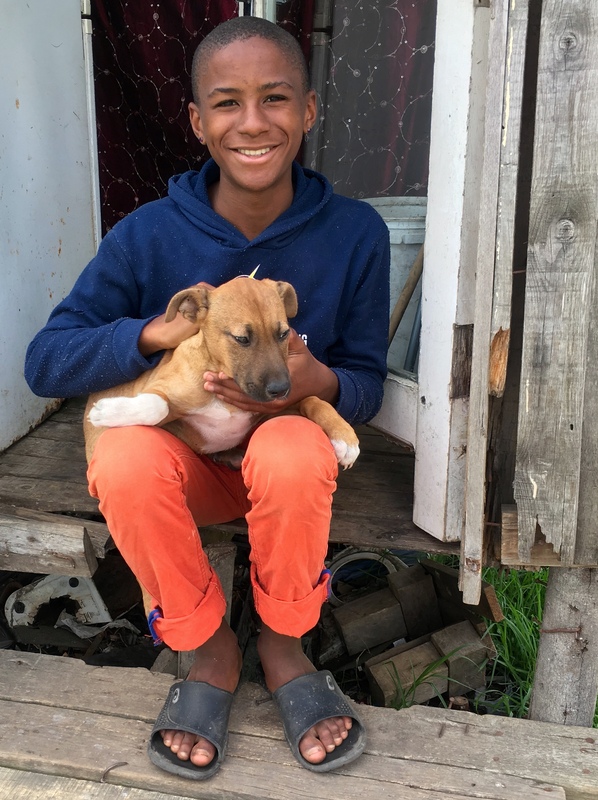 Kyle developed a strong friendship with Akhona when the Khayamandi team visited in 2014 and Kyle (U.S. army medic) was treating a large cut on Akhona’s foot. 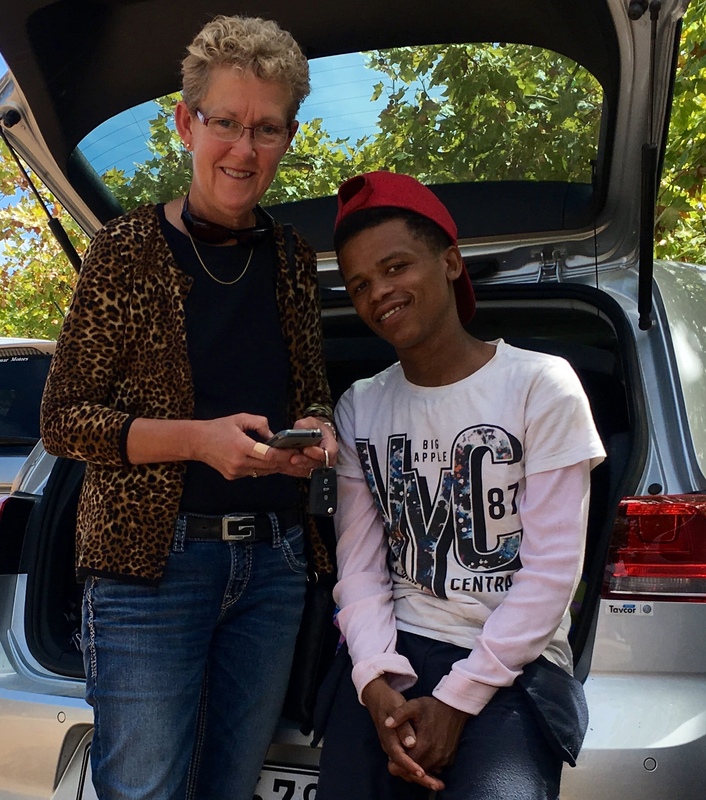 This time Kyle’s wife accompanied him to Knysna such that she could meet the 17 year-old boy Kyle had grown fond of. 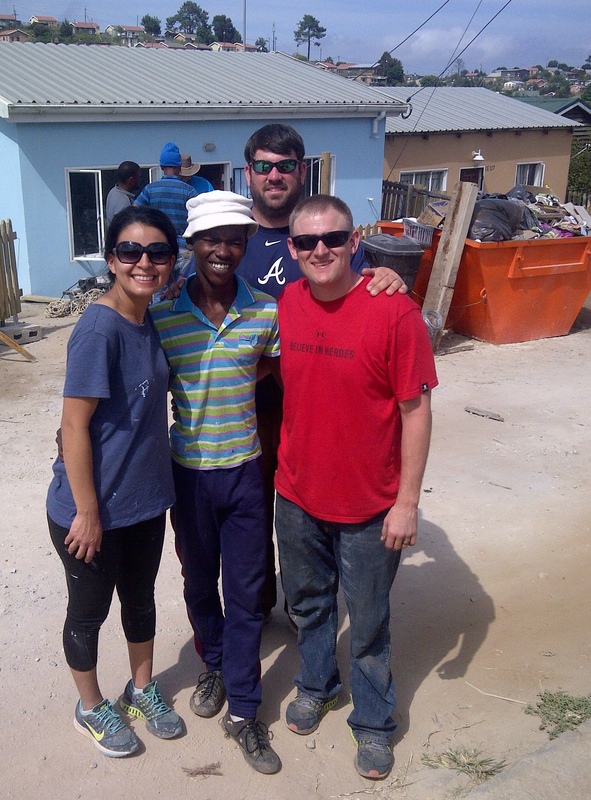 Tears were shed, and Jennifer and Kyle continue to be very supportive of Akhona who now works for a new painting contractor. 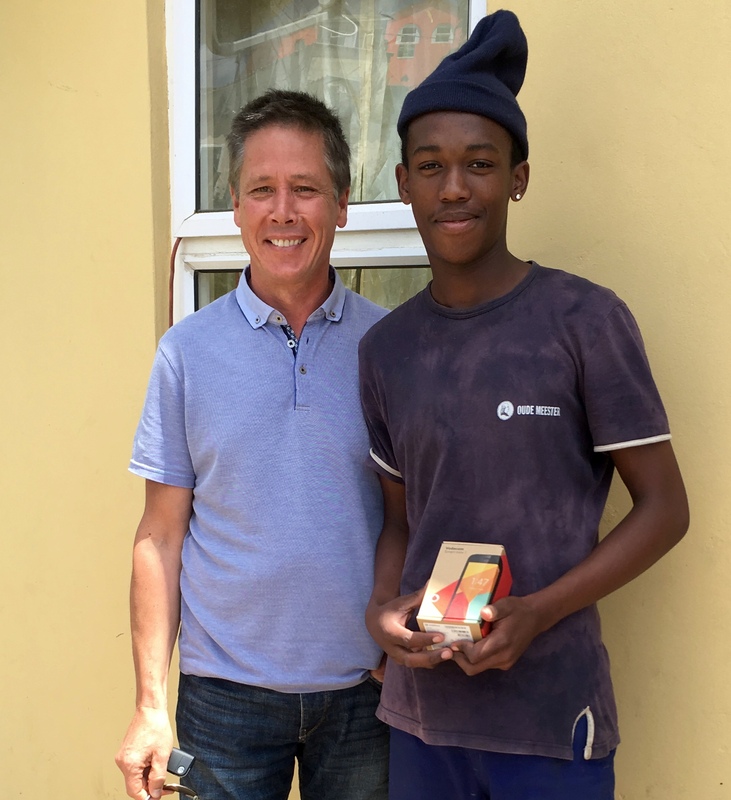 Jim was introduced to Athi in December and Athi’s extra effort at the Khayamandi work site earned him the largest cash bonus of all the youth. 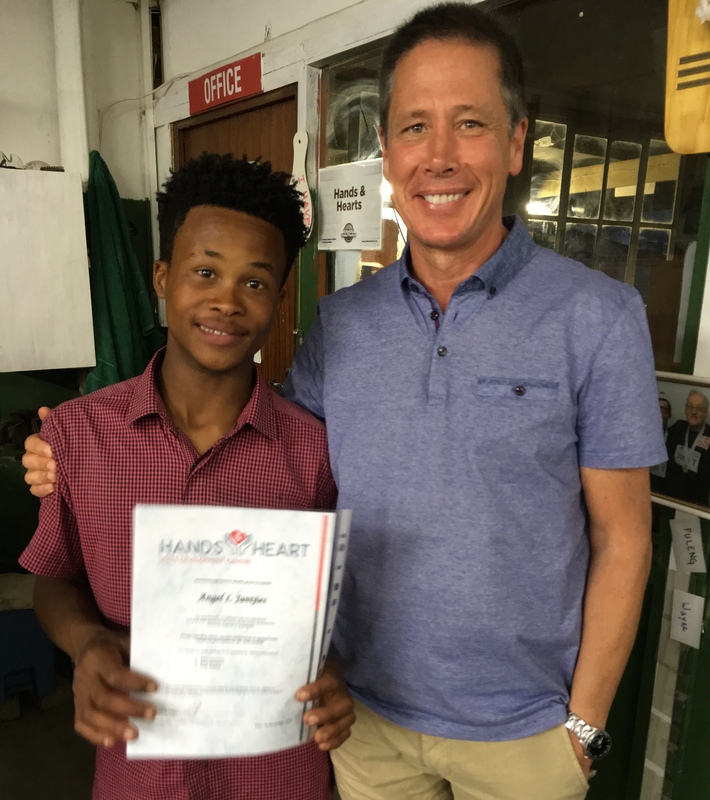 Athi has been stalled in life since completing high school and we introduced him to a 1 year trade skills program called Hands and Hearts. 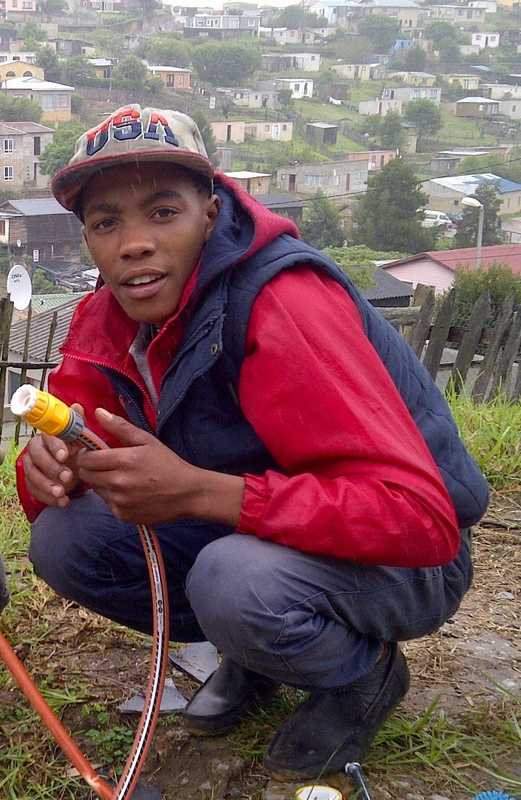 Upon completing his week with Khayamandi, Athi applied to the skills program and was accepted. He loves the program and is now hopeful about his future. 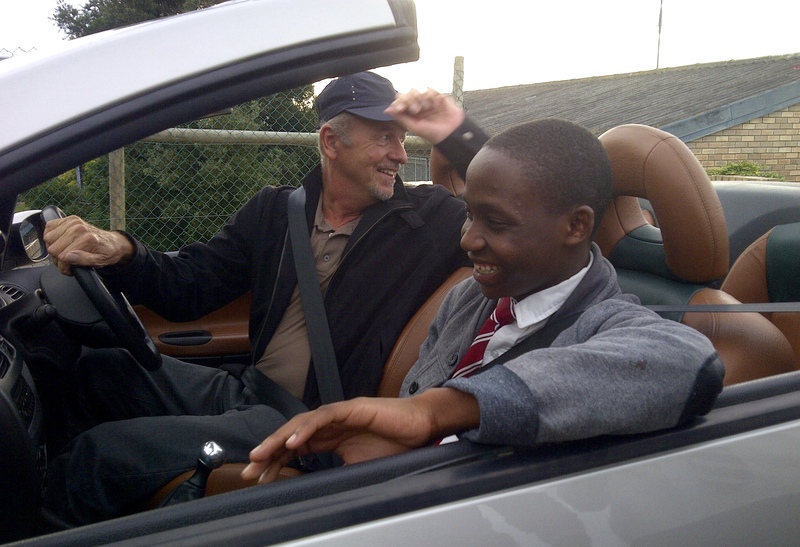 Jim was recently introduced to Andrew who is 19 and ceased attending school in grade 9. 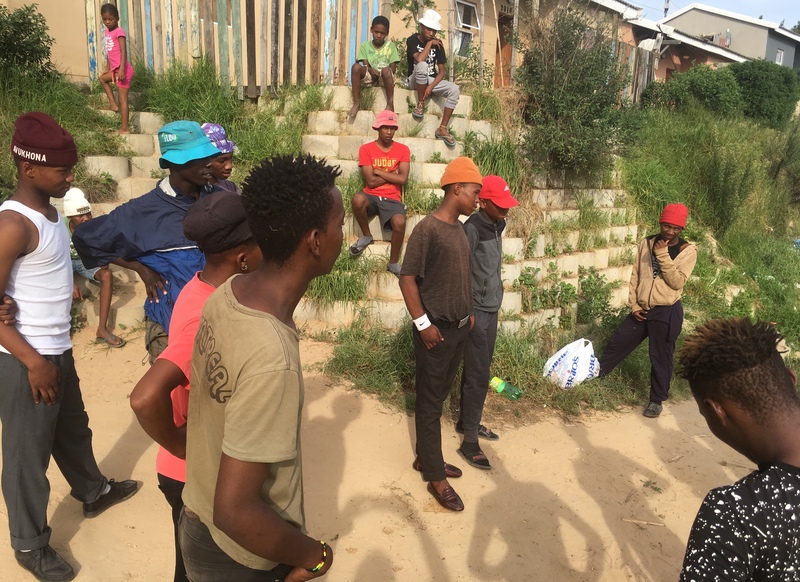 Last week they identified possible sites for Andrew to start a car wash business catering to taxi vans in the township and, on Monday, he and Jim will acquire the supplies Andrew needs to start earning an income. 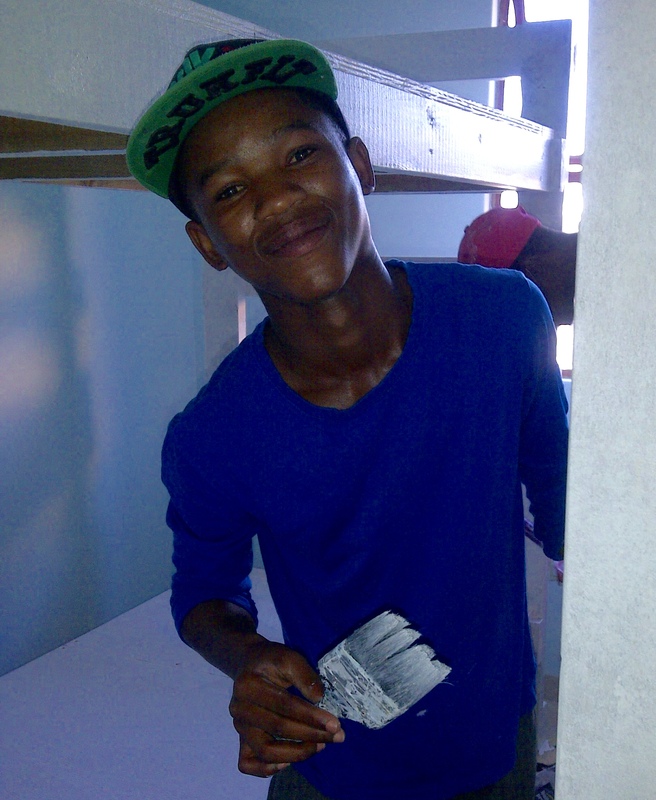 Masibulele completed grade 12 in November and commenced a 1 year business certificate at TSiBA College on January 25th. 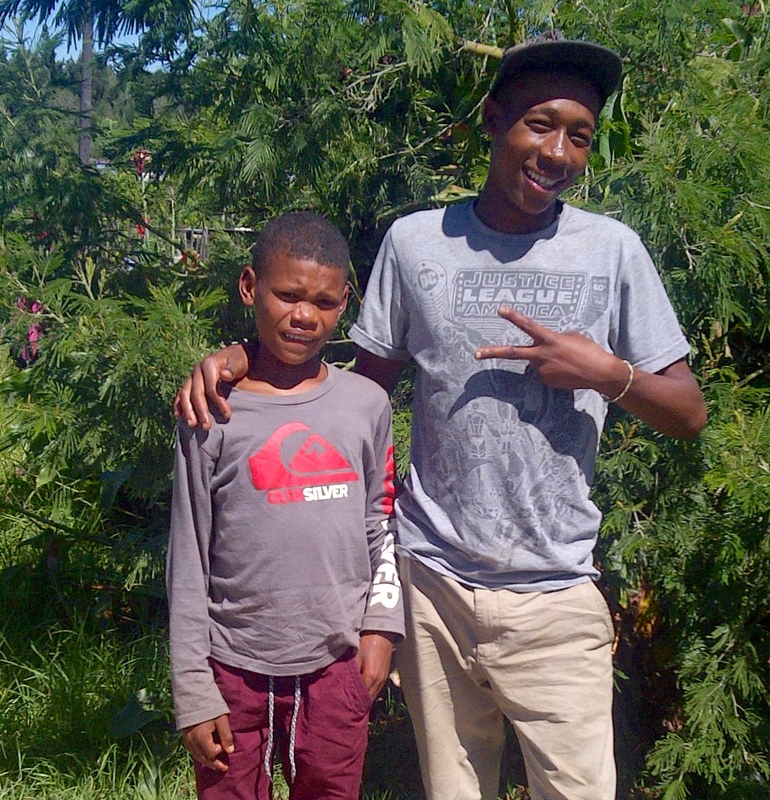 Mandla just started a 1 year certificate in social work (with sponsorship from Khayamandi) at a Cape Town College. 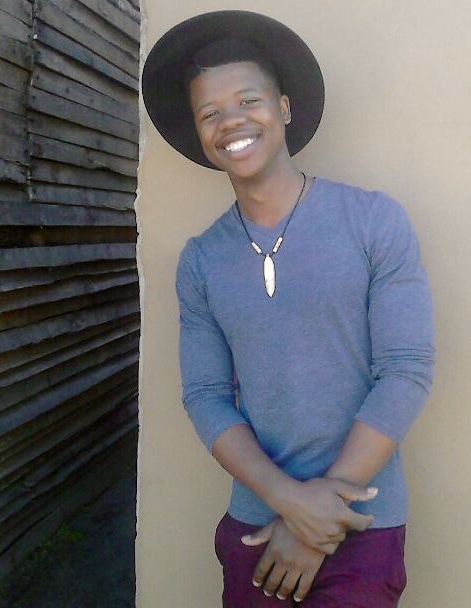 Having lived 12 of his initial 18 years in an orphanage, it has always been Mandla’s dream to study social work and help disadvantaged youth. 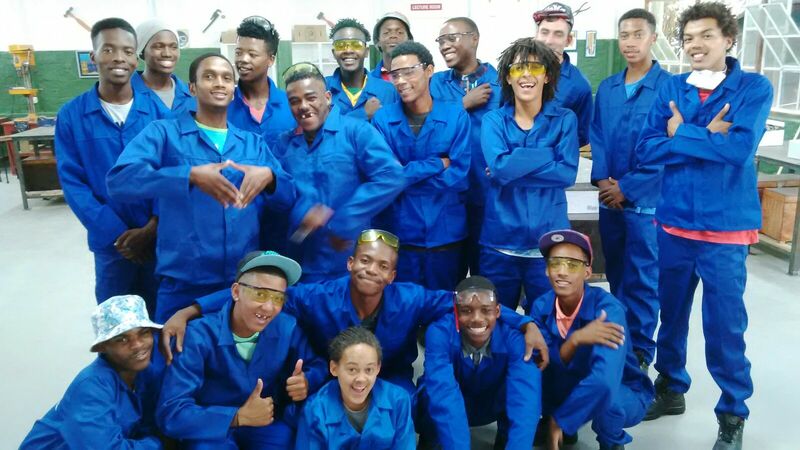 Hands & Heart is an 11 month trade skills program operated by YFC Knysna which provides hands-on training in plumbing, tiling, carpentry, and welding, along with business and life skills. 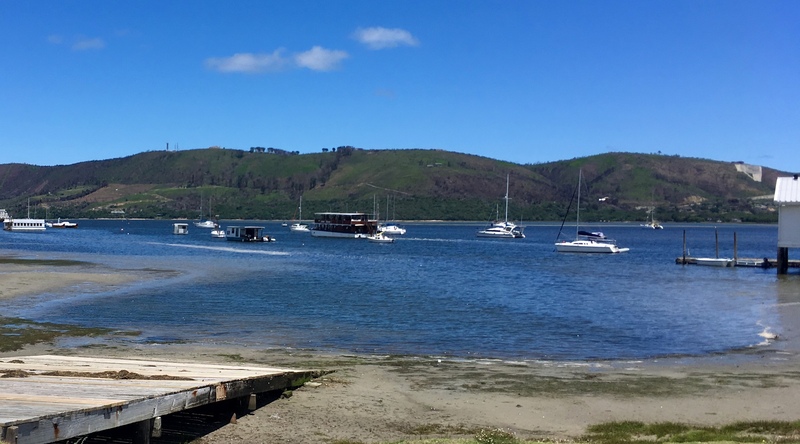 We believe this is one of the best programs in Knysna! 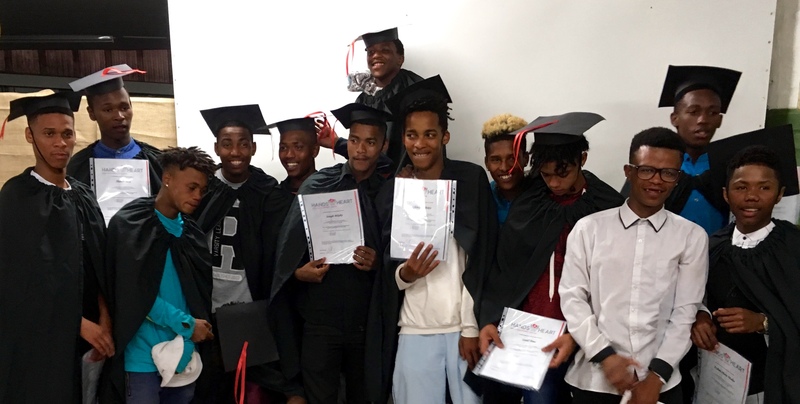 Three of the boys we mentor joined the class of 2016 on January 25th and they all love it! 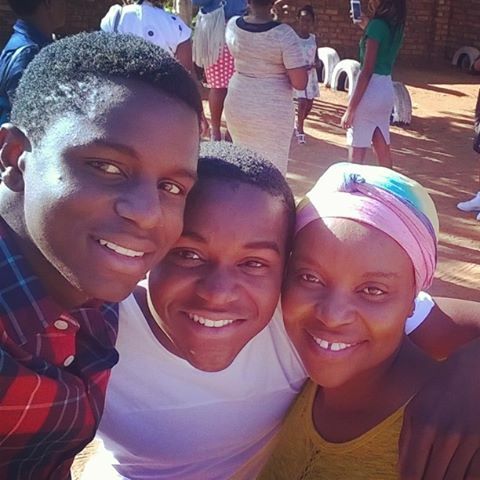 Vogen is 17, Athi is 21, and Gavin is 23. This represents a new and promising start in life for all 3 guys. 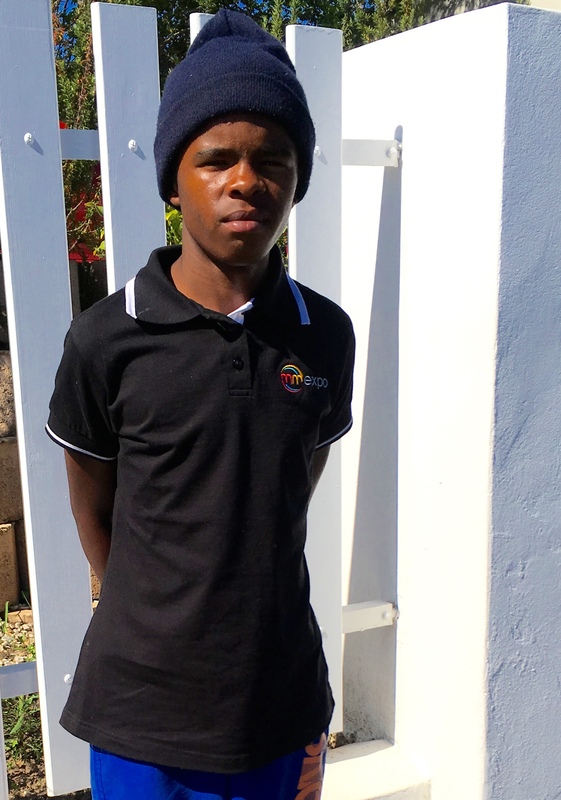 Ntokozo continues to do well (grade 10) at the private school he attends, thanks to sponsorship from Khayamandi. 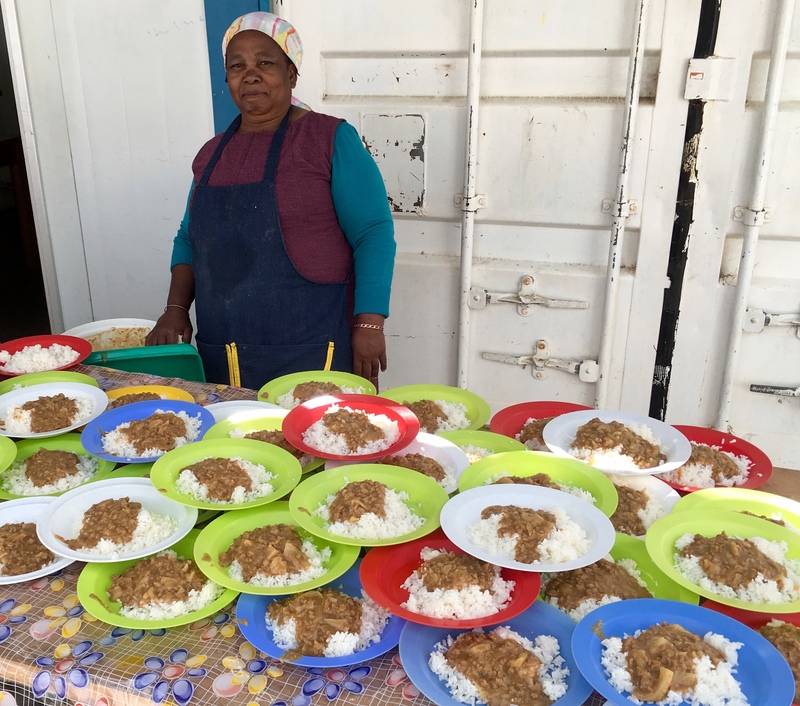 While he was unable to work at the safe house project due to school, Ntokozo joined the Khayamandi team for dinner on their final night. 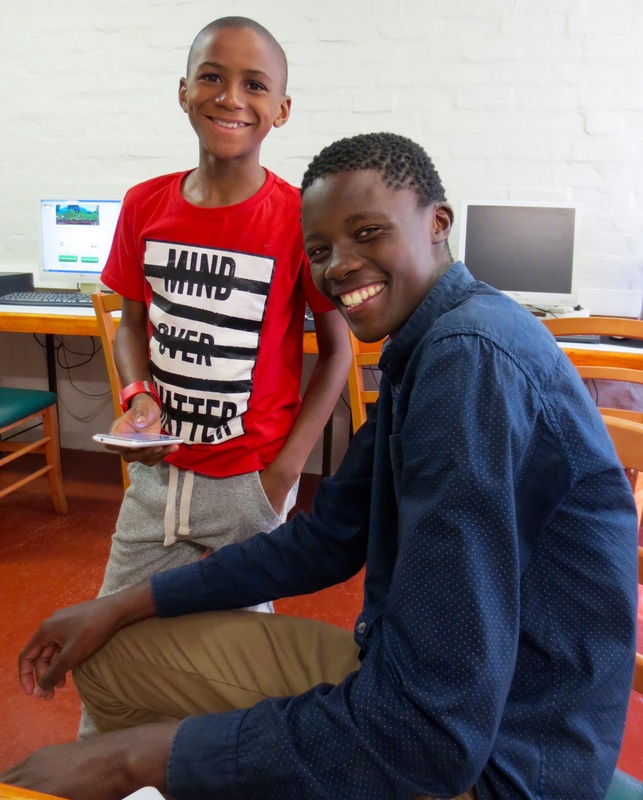 Ntokozo is Captain of his school chess team and recently completed peer counselling training. 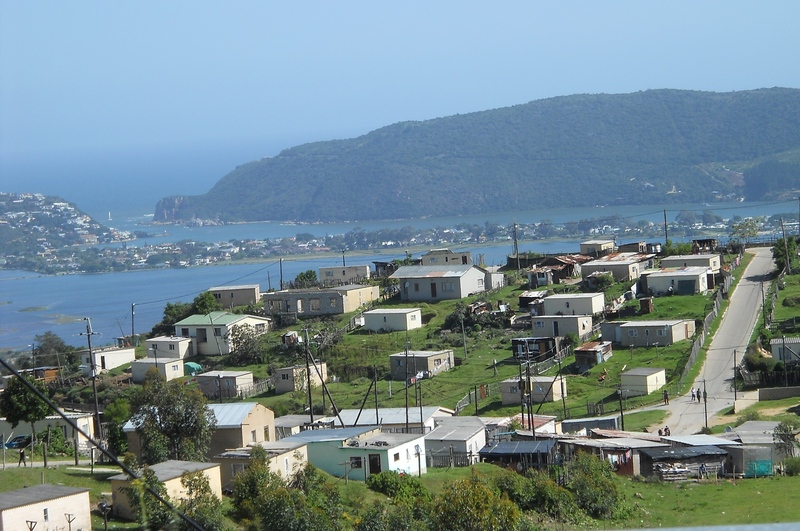 Life in the townships is difficult and our friends who are involved in social-betterment projects are fond of saying that Africa is not for sissies. 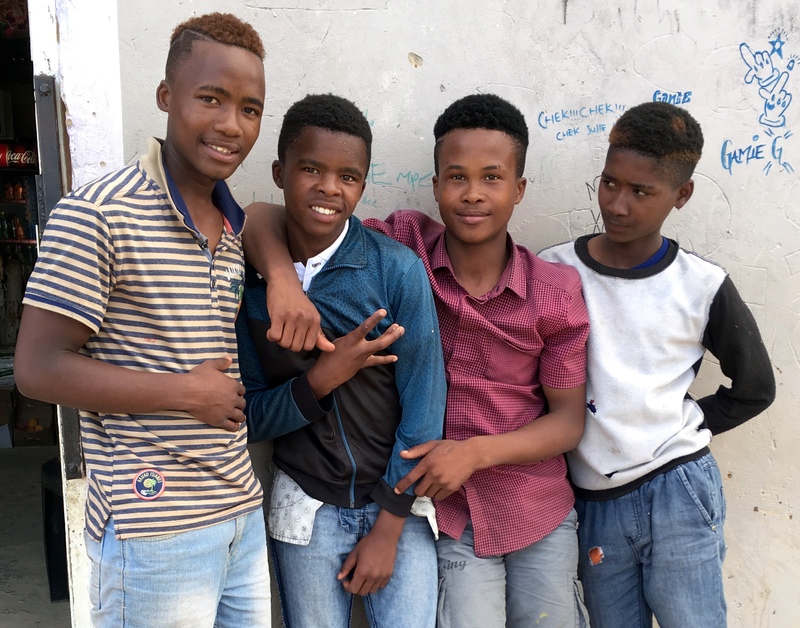 Since our previous blog post, one more boy Jim knew was stabbed and killed, and another almost died from stab wounds. Jim met the 17 year-old who was killed just 2 weeks prior to his death. 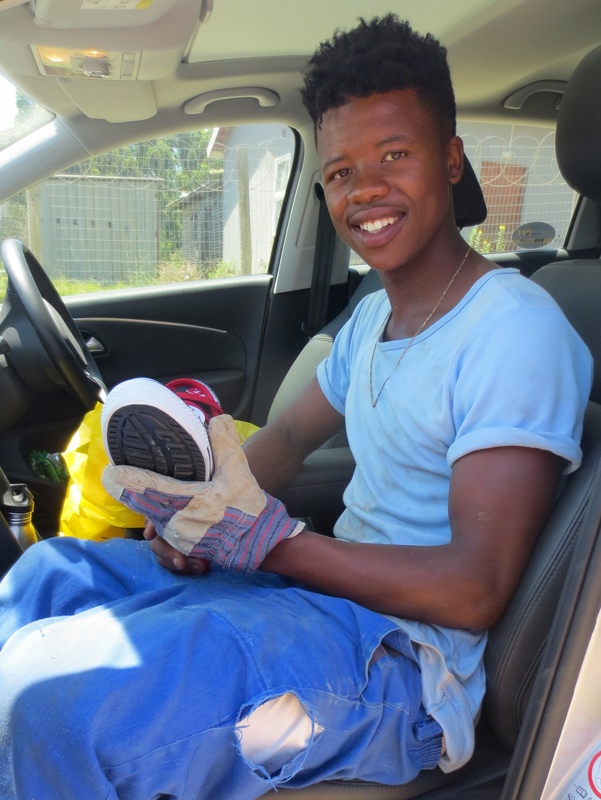 He dropped out of school in grade 10 and was scheduled to work with the Khayamandi team as the next step in his new start in life. 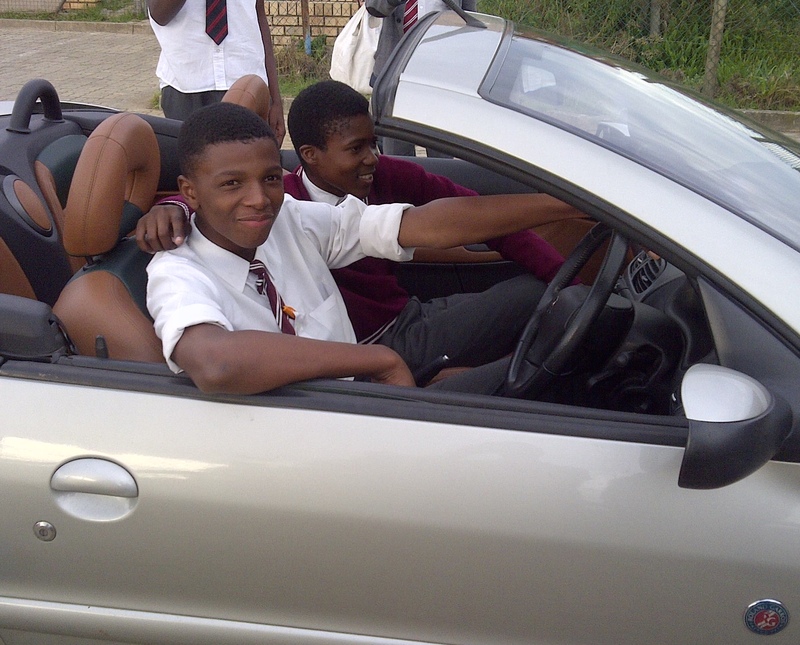 Buntu is 17 and in grade 10. 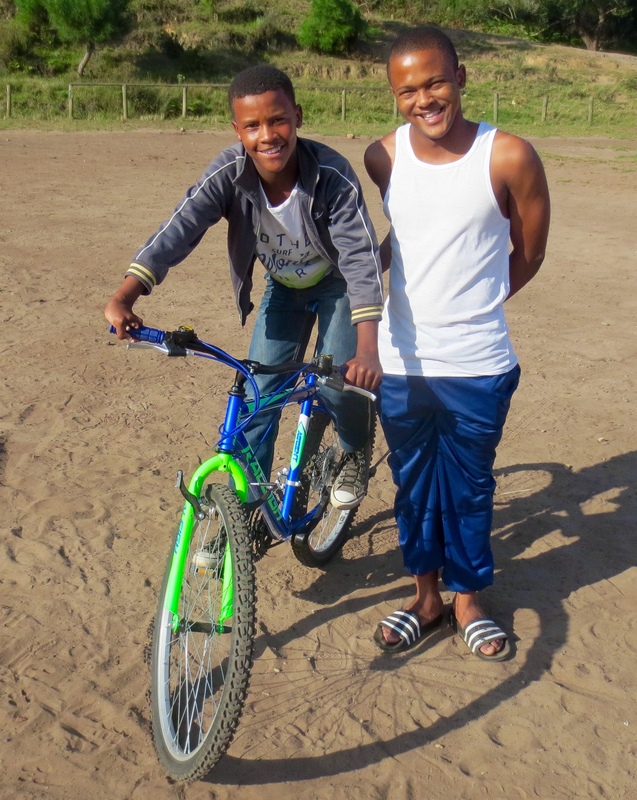 He is a good student, responsible guy, and joined our Bulele mentorship group in December. 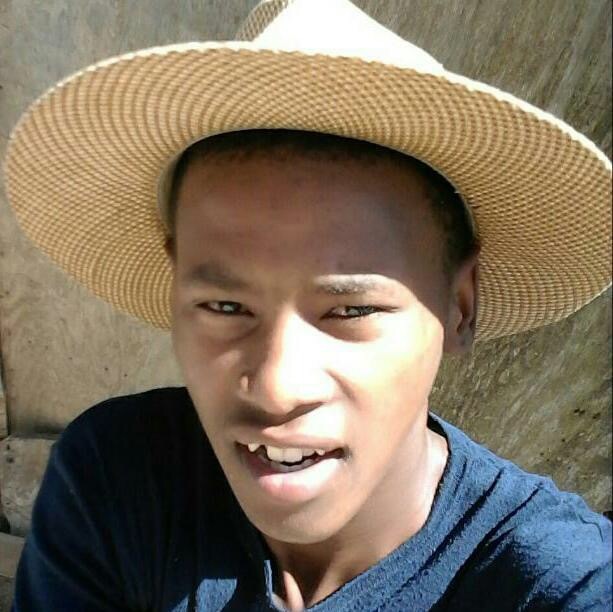 Buntu was stabbed mid-January during daylight hours less than 1 kilometre from his home. He required emergency surgery. 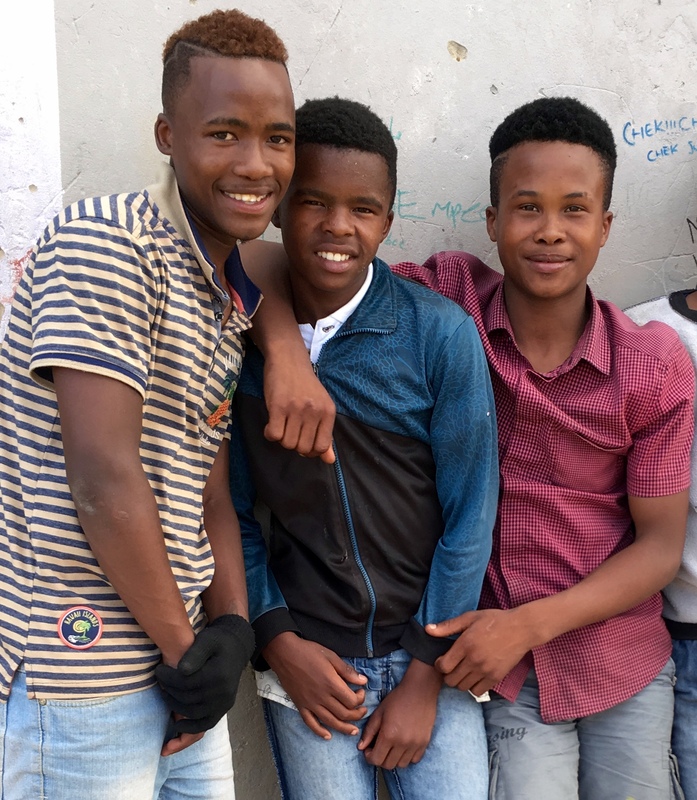 Buntu (far right in striped shirt) is now doing much better, and returned to school this past week. 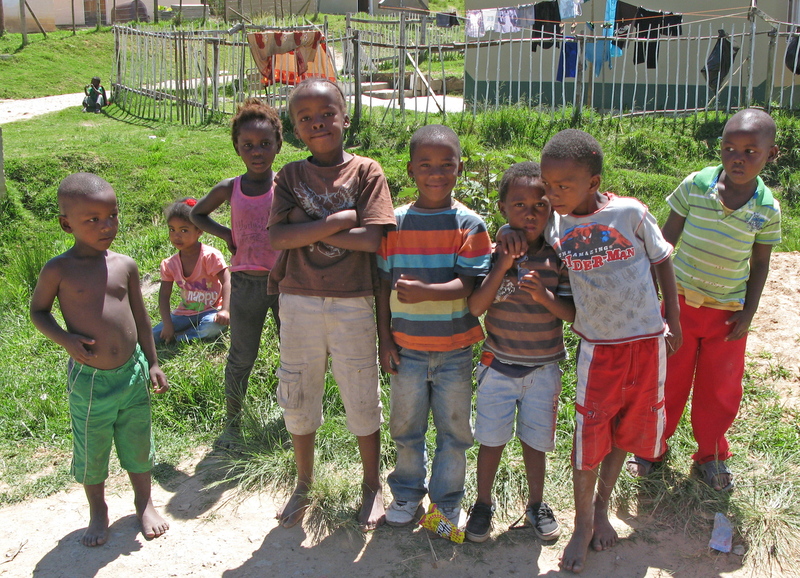 However, growing up in the township is not easy. 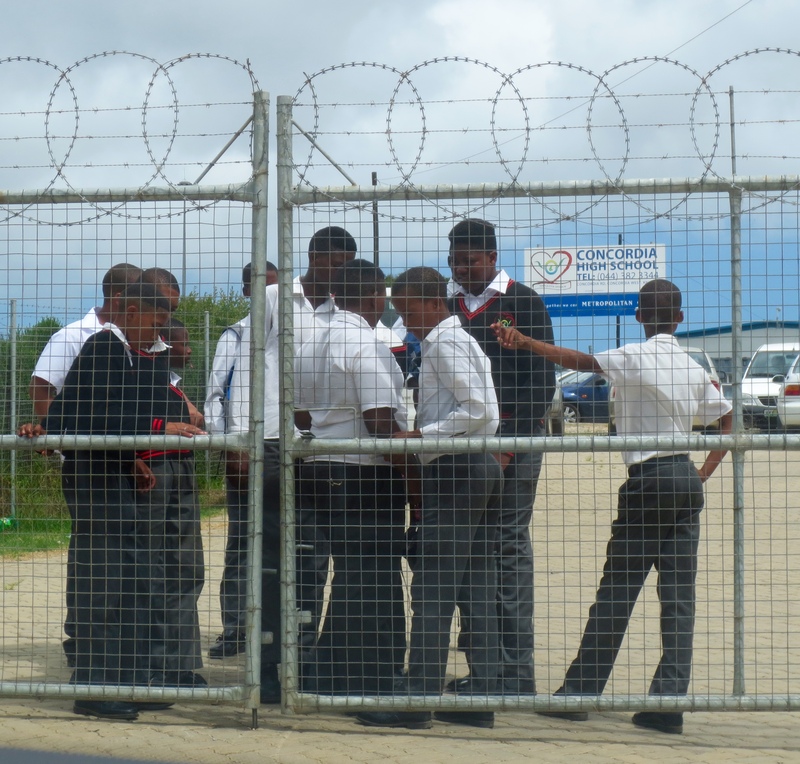 Students waiting for school gate to be unlocked. “Schools Reflect Society they do not change it. 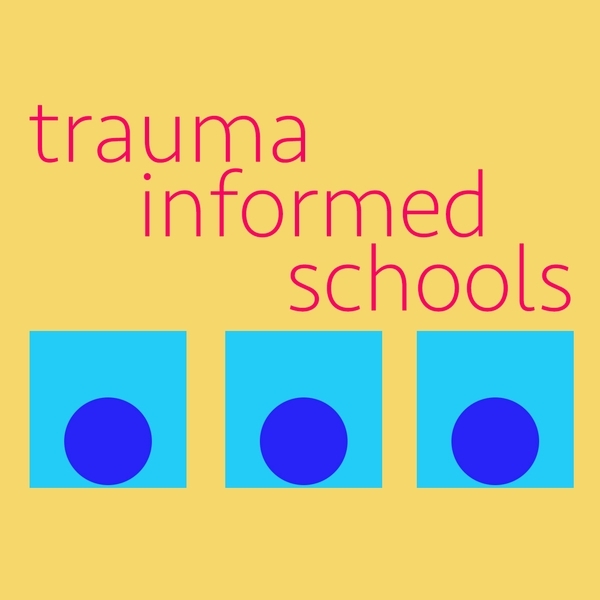 The danger to our society is maintaining the myth that the miseducation of millions for over half a century merely results in personal tragedies.” Dr. Martin Haberman.